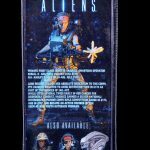 This year, fans have been celebrating the 30th anniversary of Aliens. 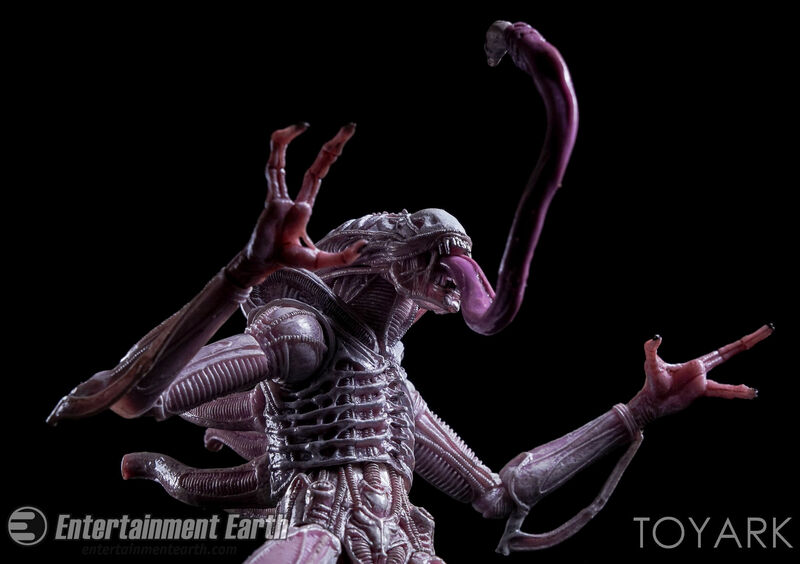 The second film in the ongoing franchise is easily one of the best, featuring numerous fantastic performances, set pieces and creature designs. 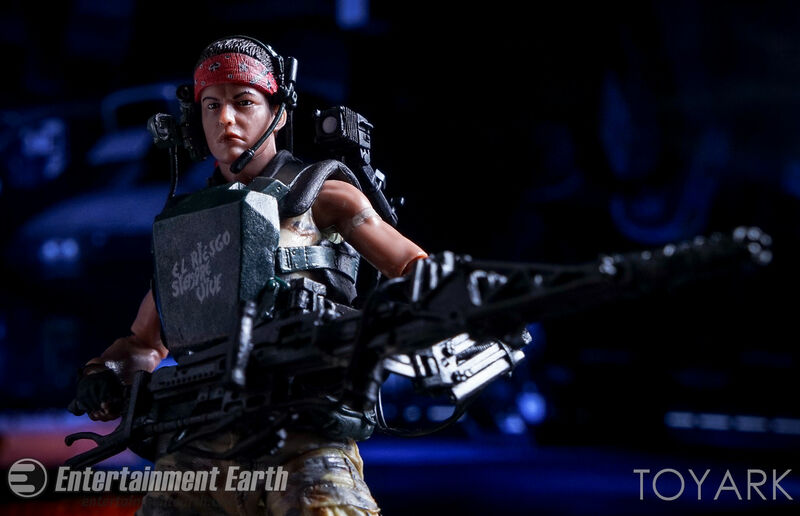 The film was packed with talent from top to bottom, and solidified Sigourney Weaver’s Ellen Ripley as a genuine action hero. 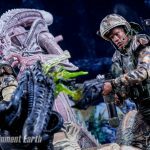 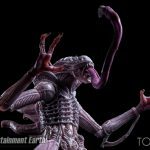 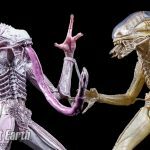 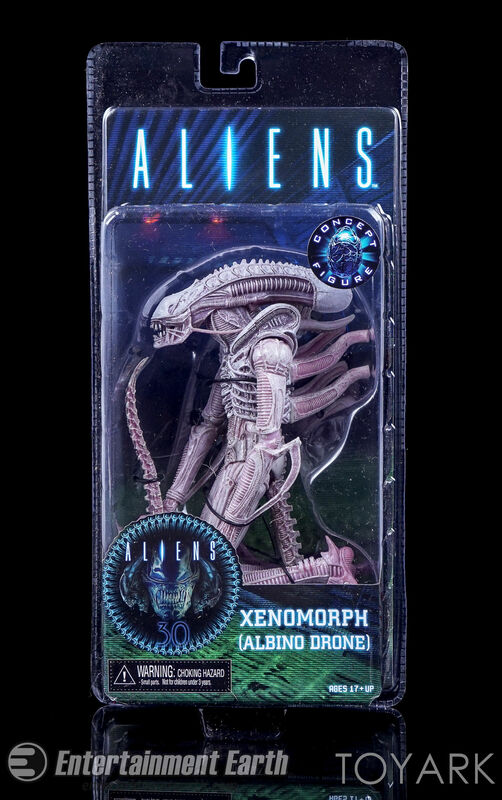 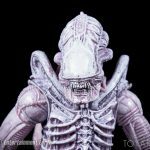 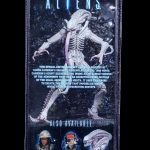 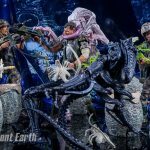 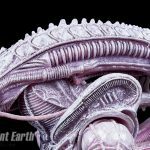 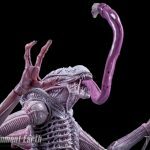 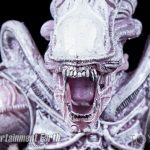 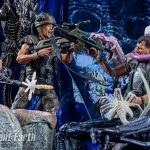 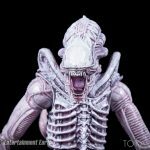 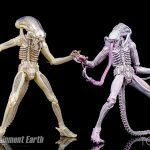 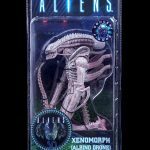 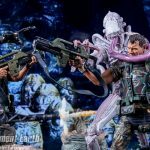 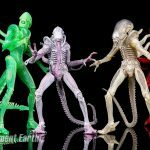 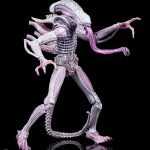 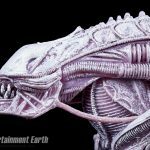 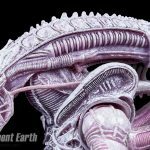 NECA is doing their part to celebrate the film, with a series of great Aliens 30th Anniversary releases. 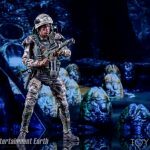 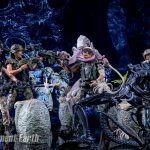 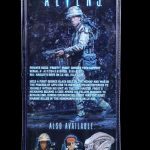 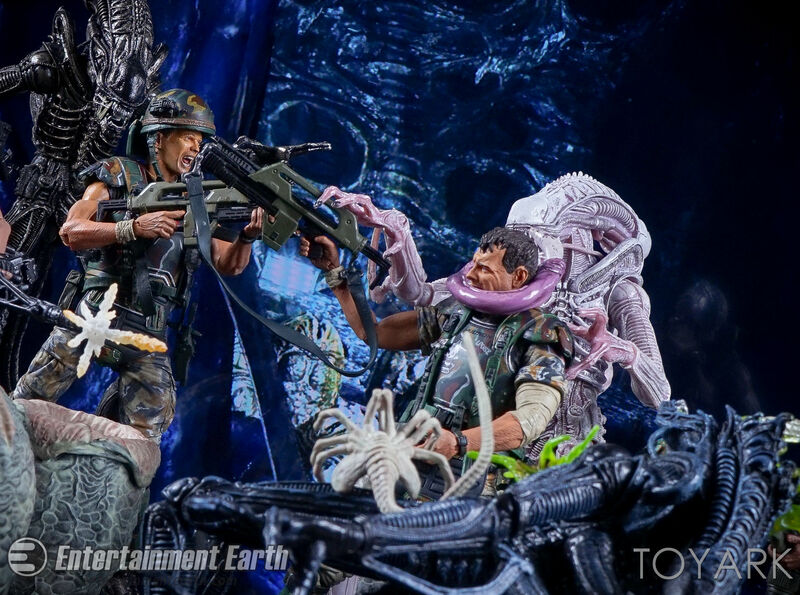 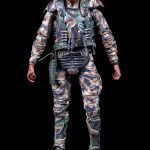 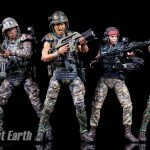 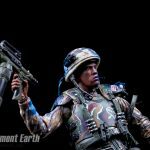 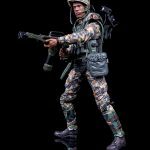 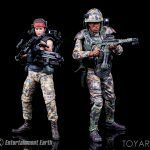 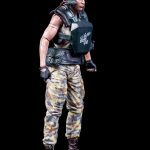 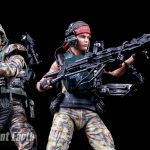 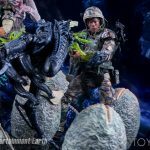 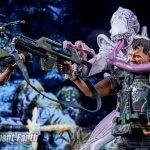 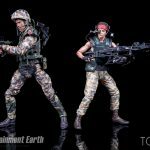 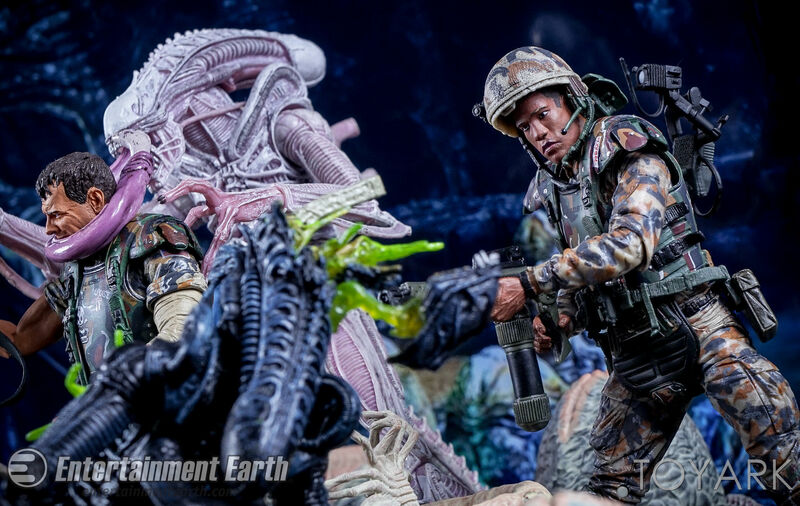 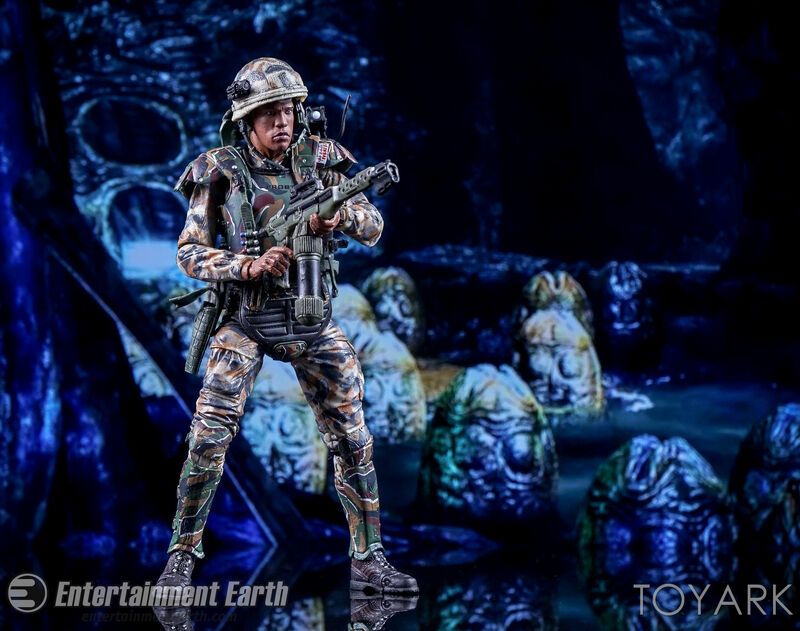 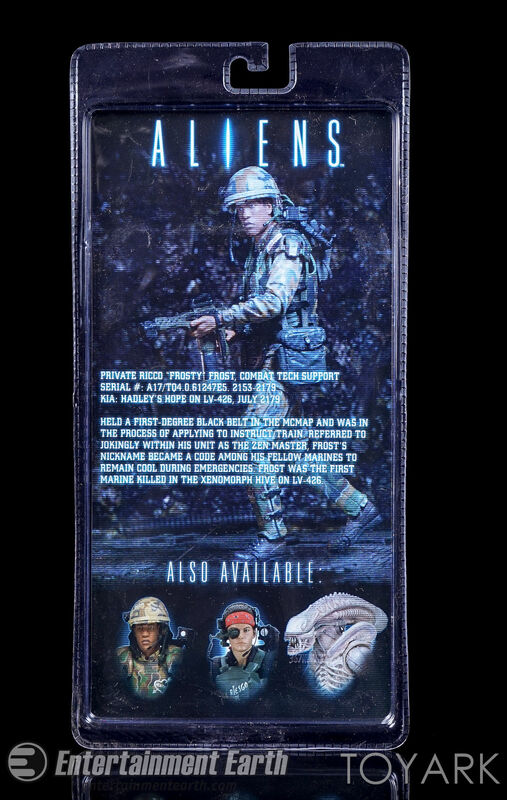 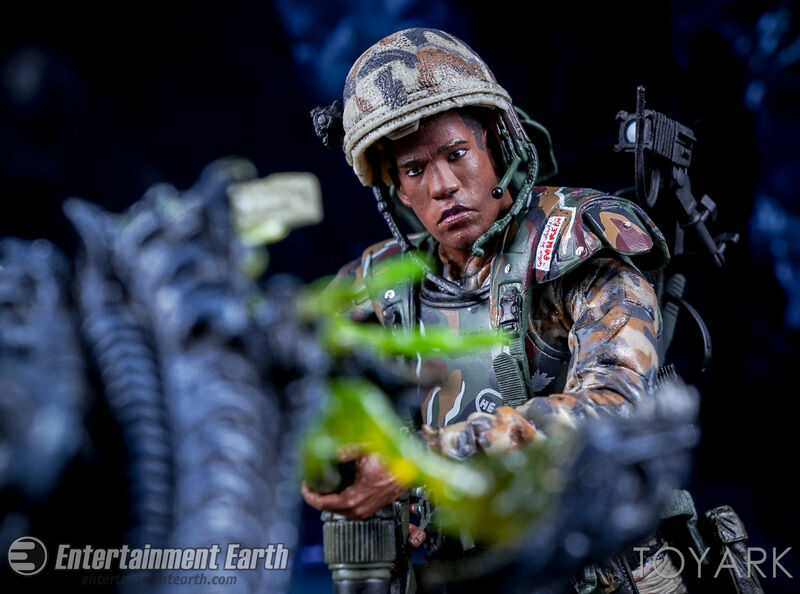 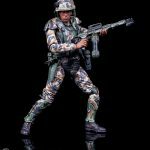 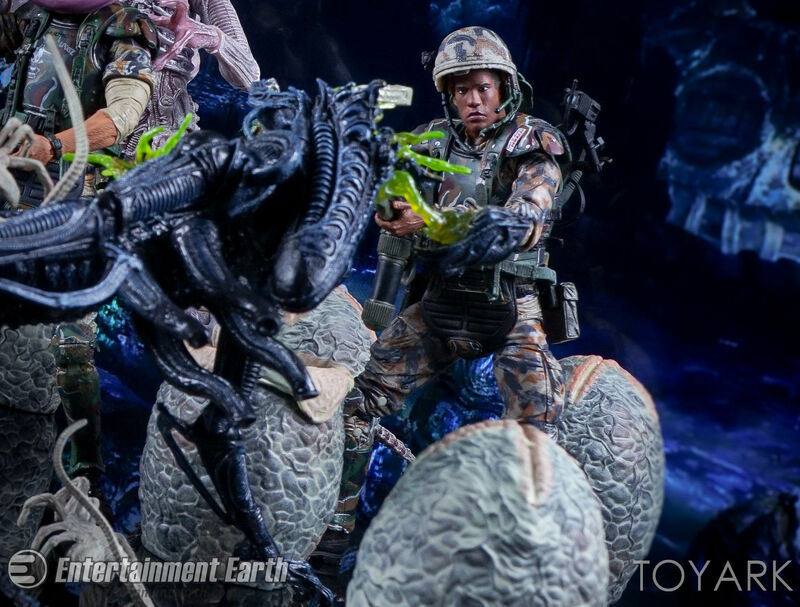 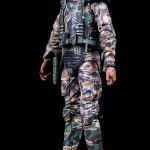 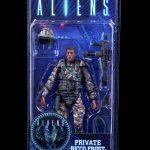 The currently available Aliens assortment, series 9, features two new Colonial Marines; Private Vasquez and Private Frost as well as a new concept Albino Alien Warrior. 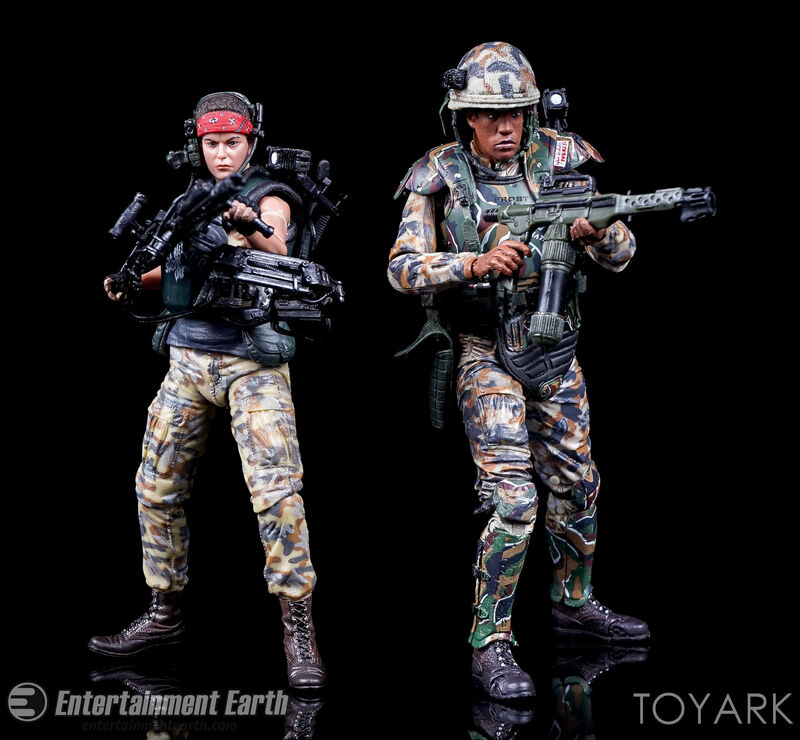 The figures are in stores now and we have them courtesy of Toyark sponsor Entertainment Earth. 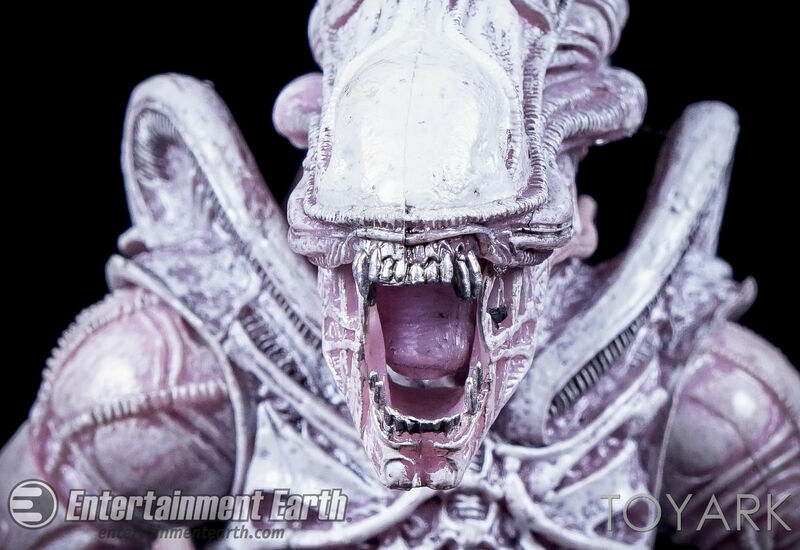 There are over 100 high resolution photos and a full review. 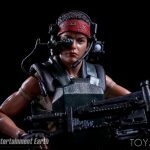 You can see them by reading on. 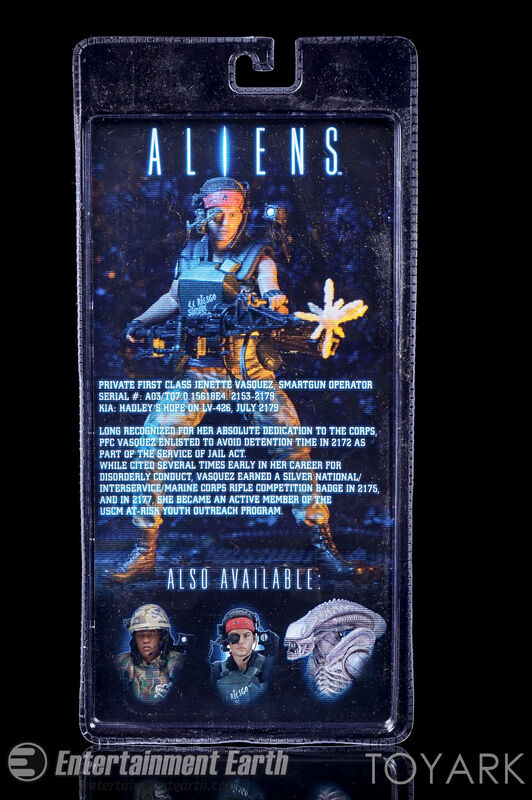 All three figures are packaged in the standard blister card we’ve been accustomed to for the Aliens figures. 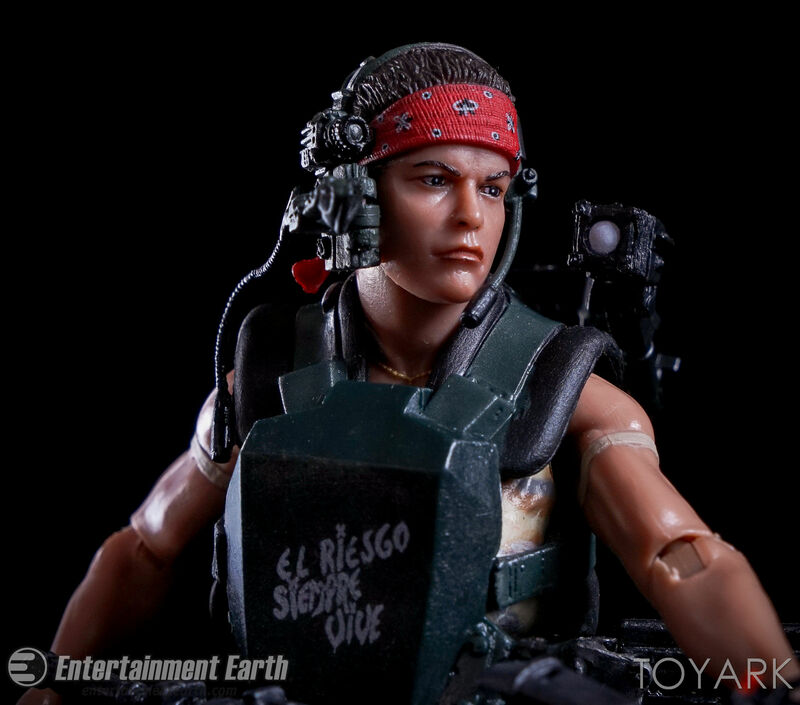 The packaging features character specific photos as well as a bio for each one. 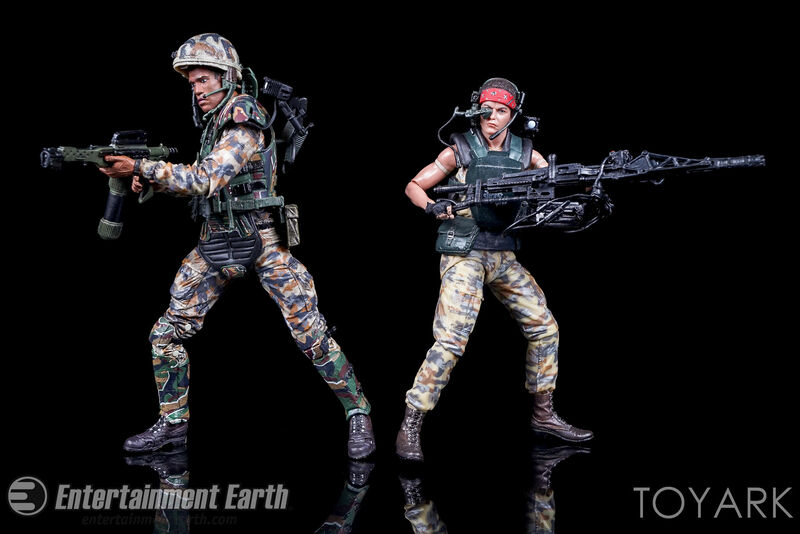 You will need to cut the plastic to remove these figures from the card. 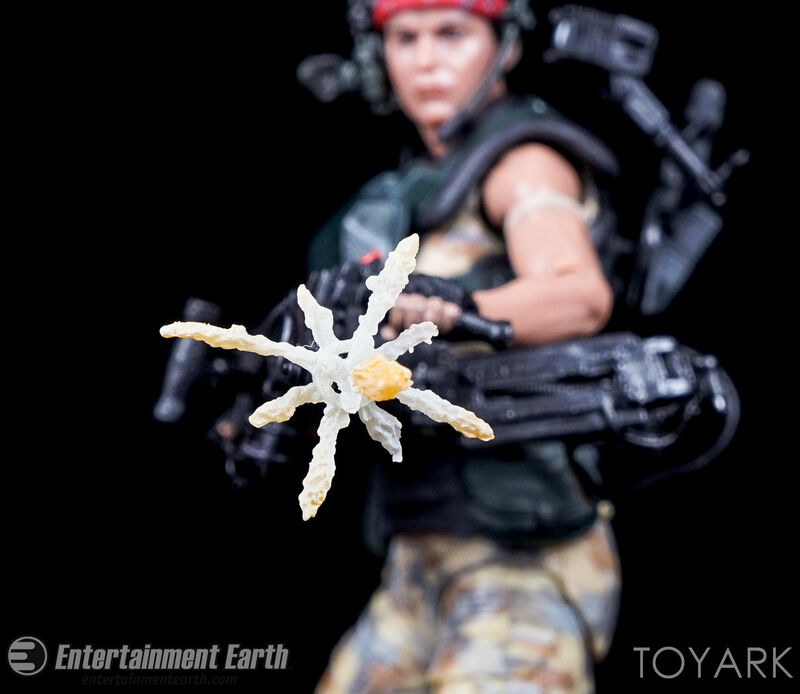 Each figure sits on a plastic tray and each is held down with multiple twist ties. 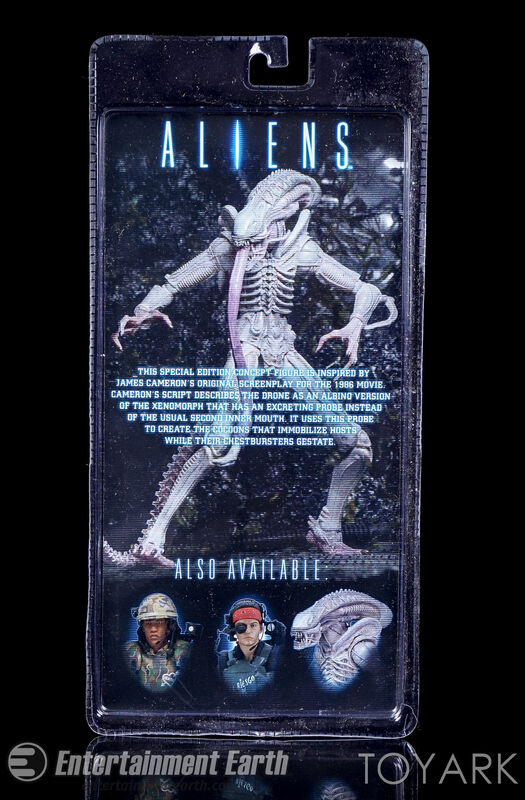 The packaging fits in nicely with previous Aliens releases if you’re keeping them sealed, and it’s always nice to have individual bios. 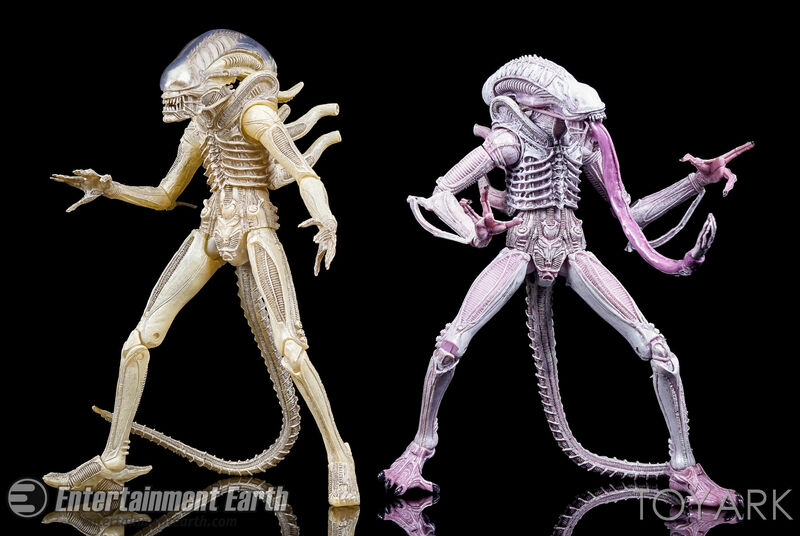 This is probably one of the most requested aliens figures I’ve seen since Ripley. 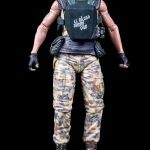 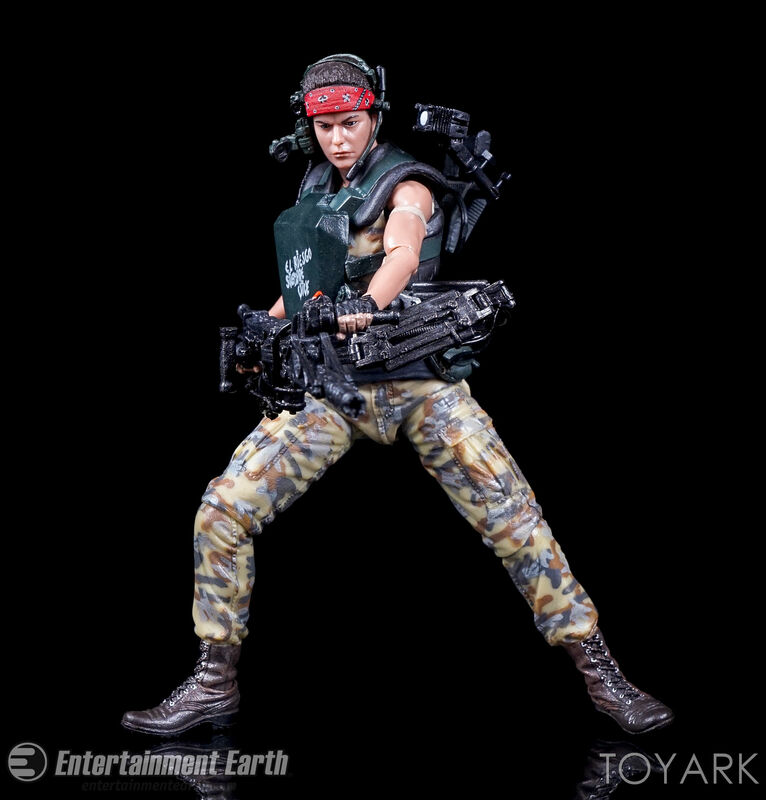 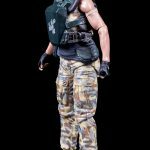 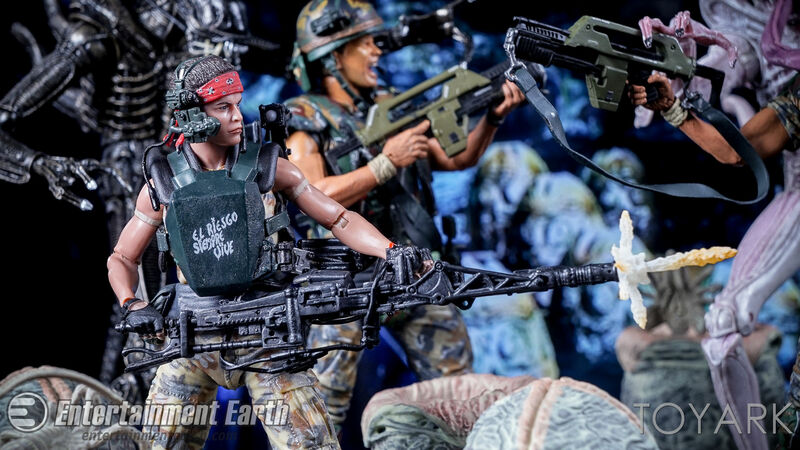 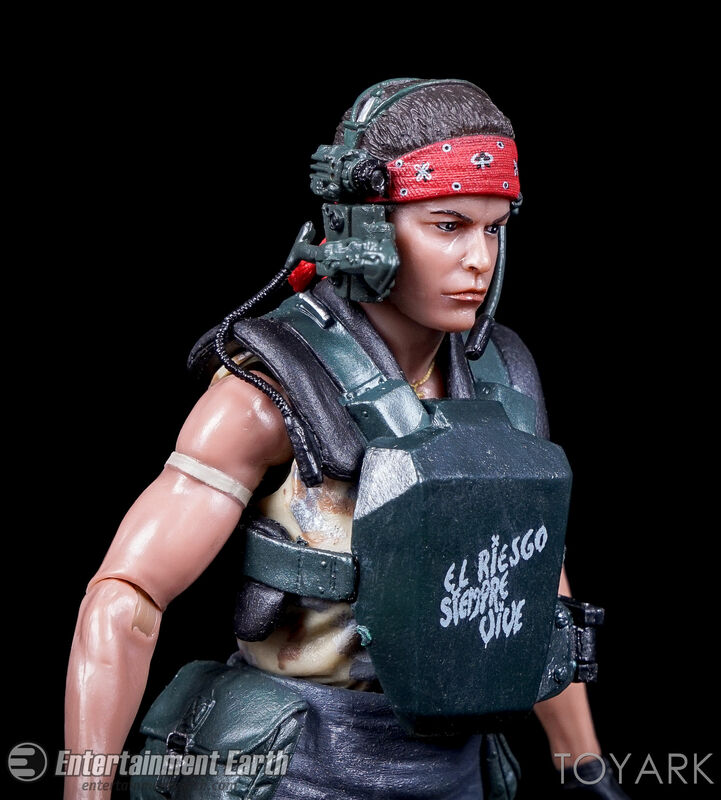 Nearly every day, I could see NECA responding to requests for a PFC Vasquez release. 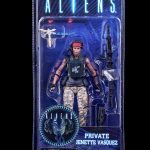 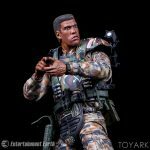 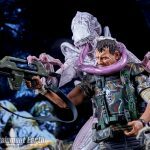 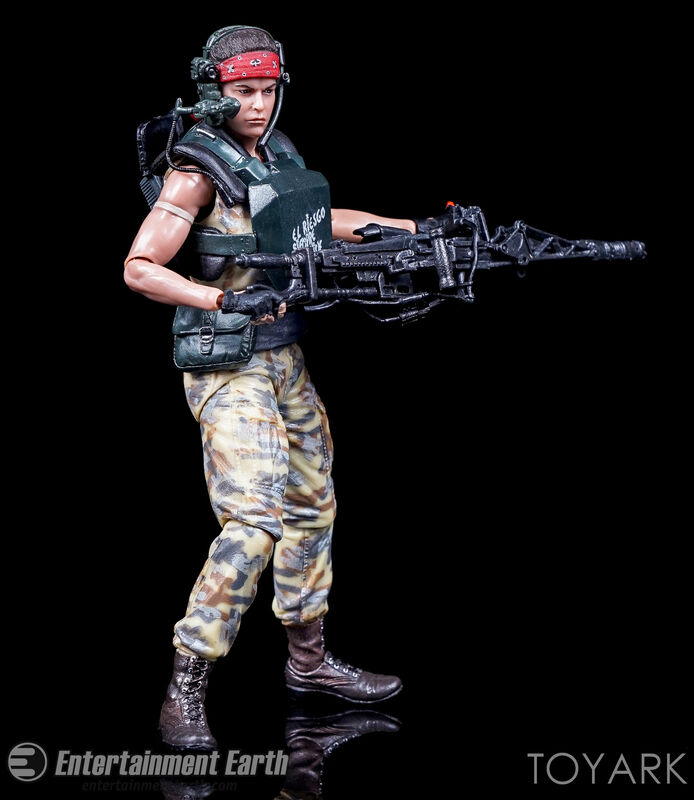 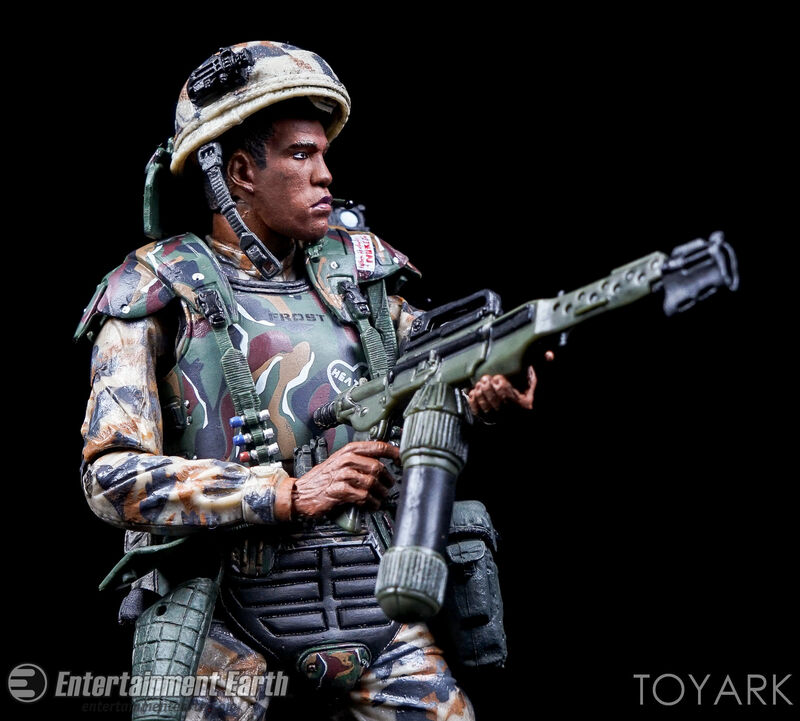 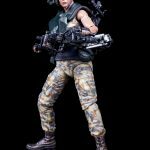 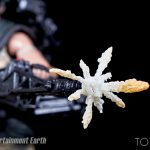 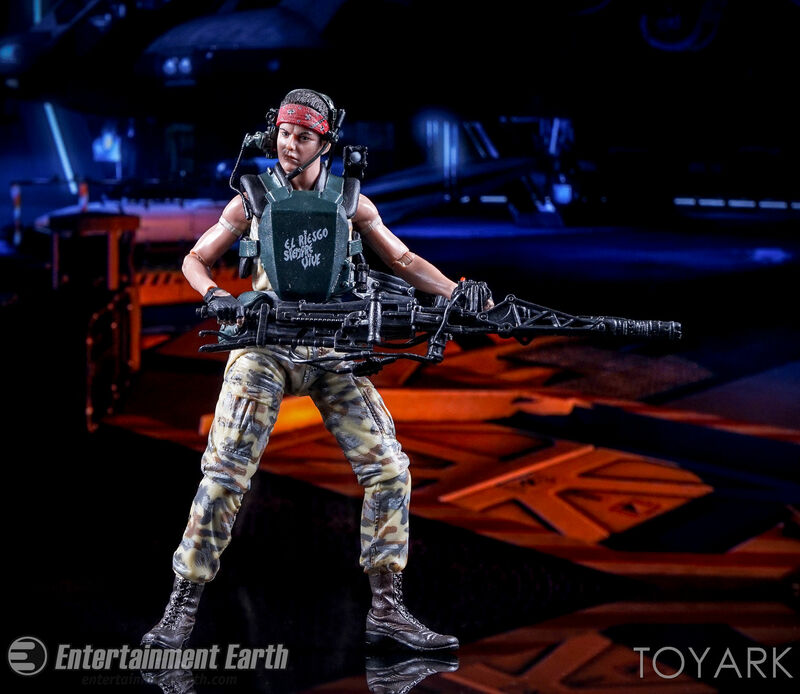 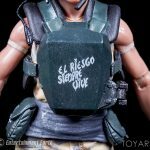 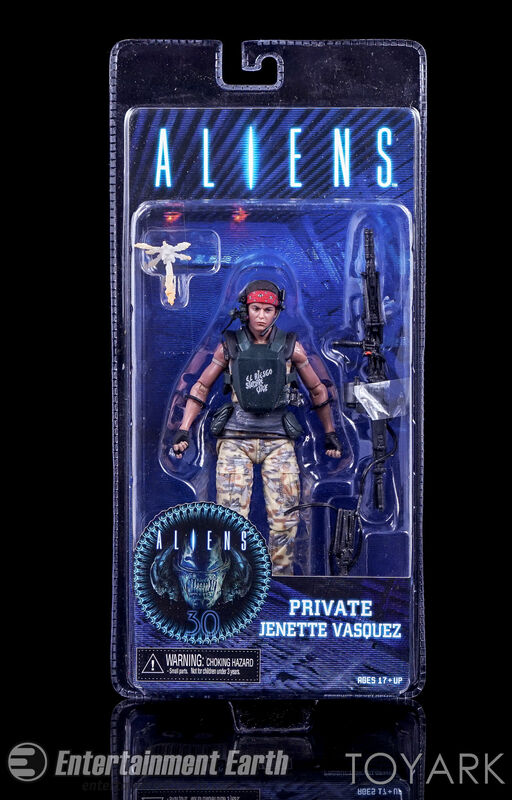 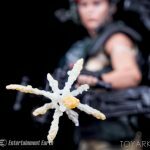 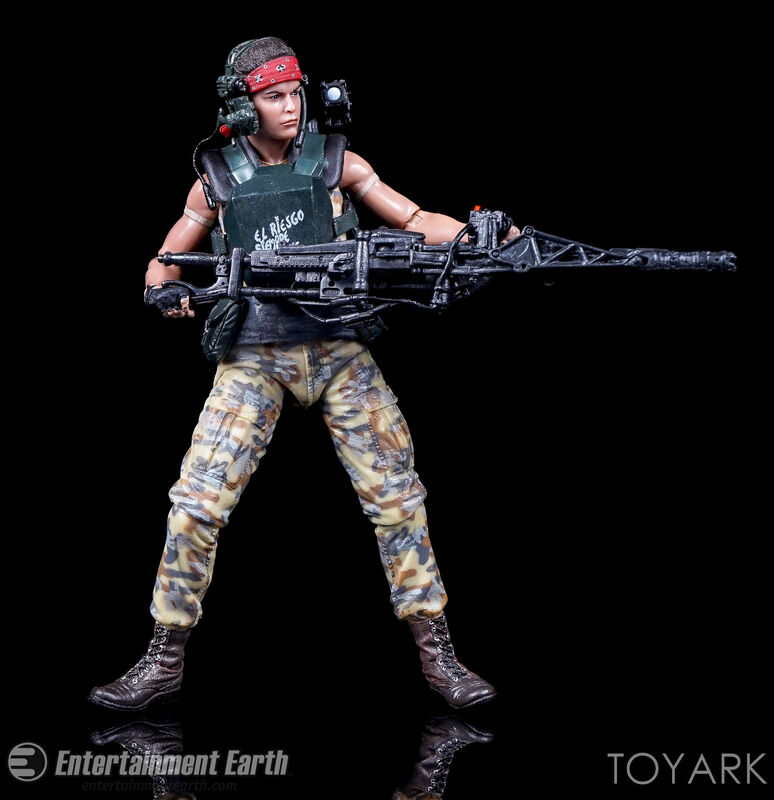 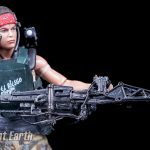 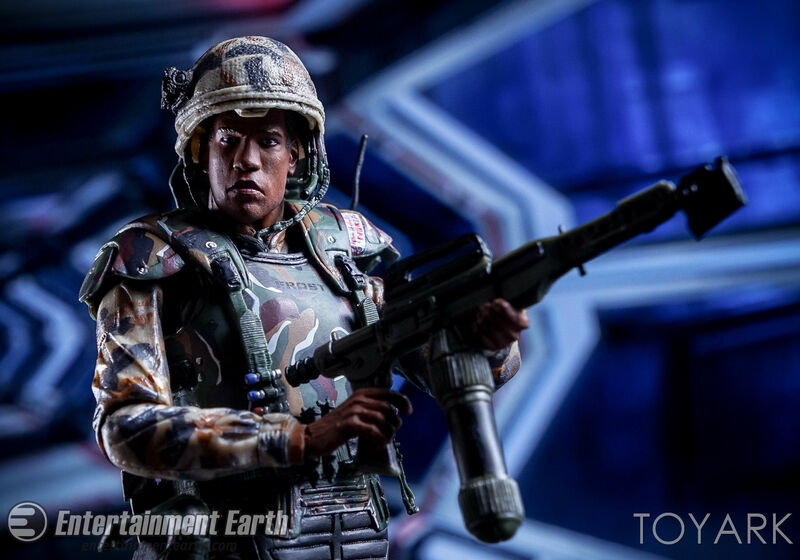 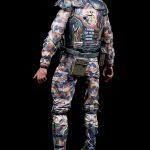 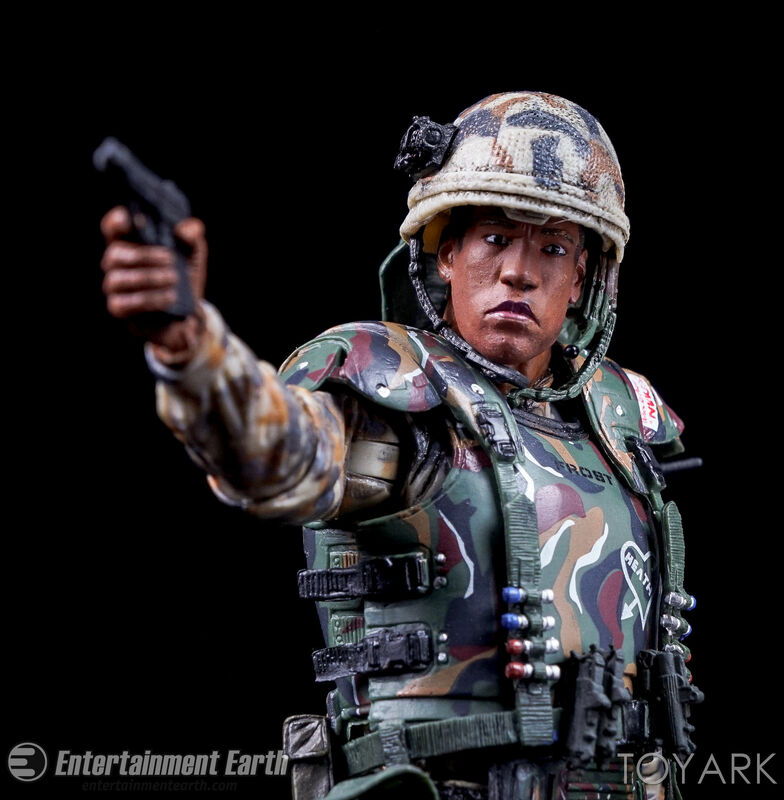 With the release of the Vasquez figure, fans finally grow their Colonial Marines ranks with one of the biggest fan favorite characters from the film. 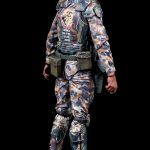 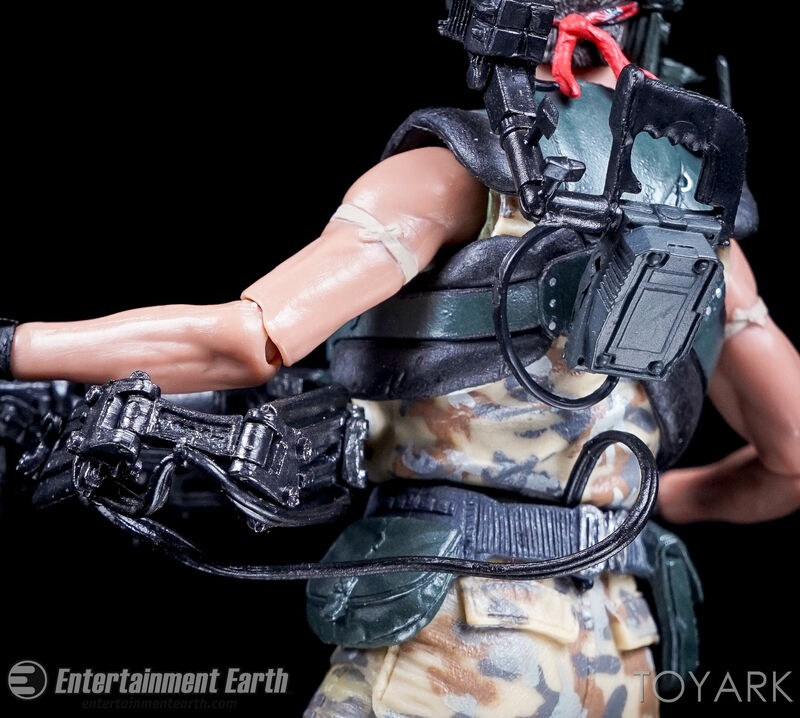 The figure includes a smartgun, an articulated harness, a shoulder mounting light and a firing effect for the gun. 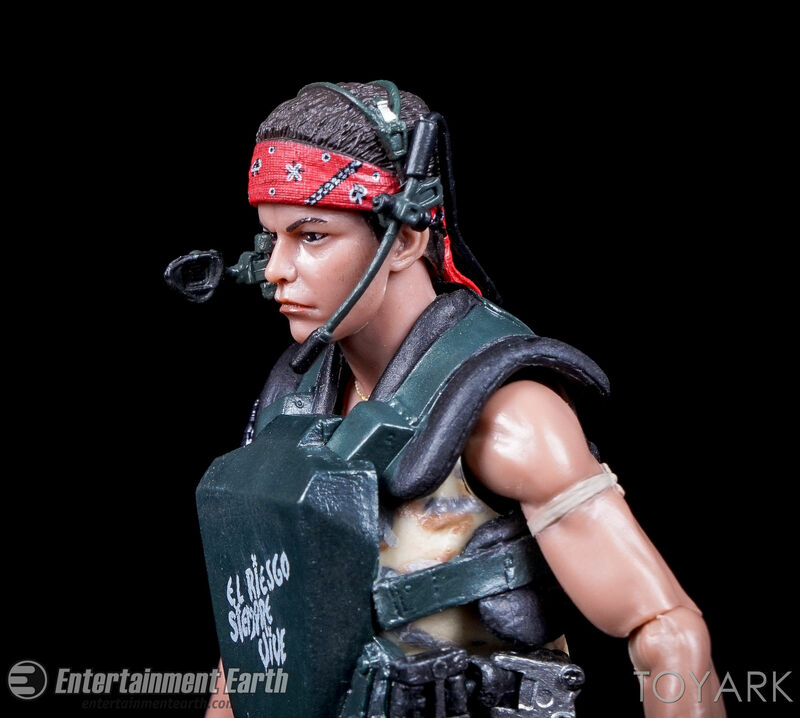 Like the film version, Vasquez comes complete with her custom armor. 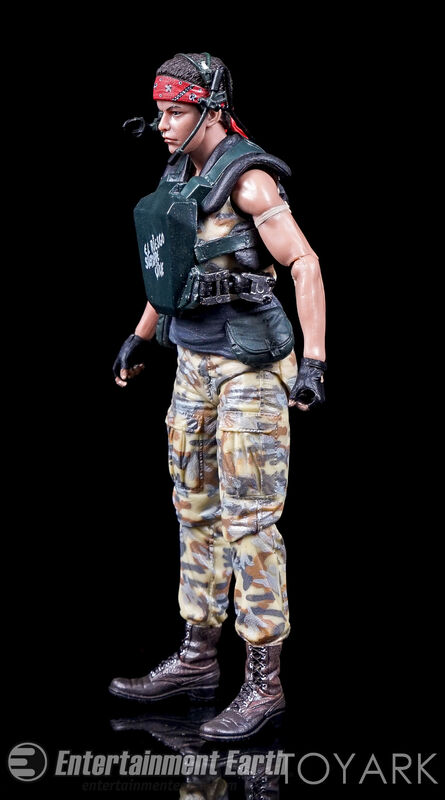 The figure has about 25 total points of articulation. 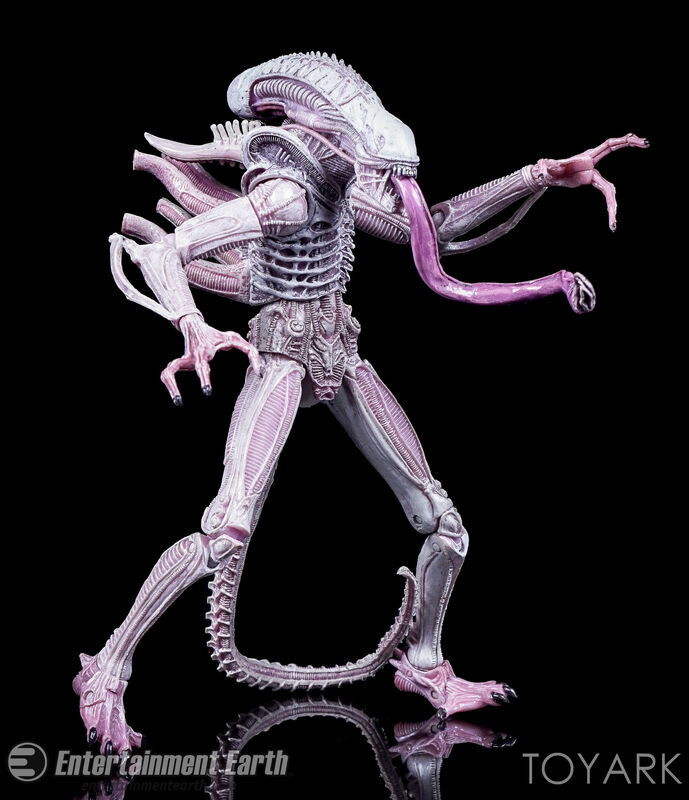 The elbows and knees are single jointed, but have enough range to allow for film style dynamic poses. 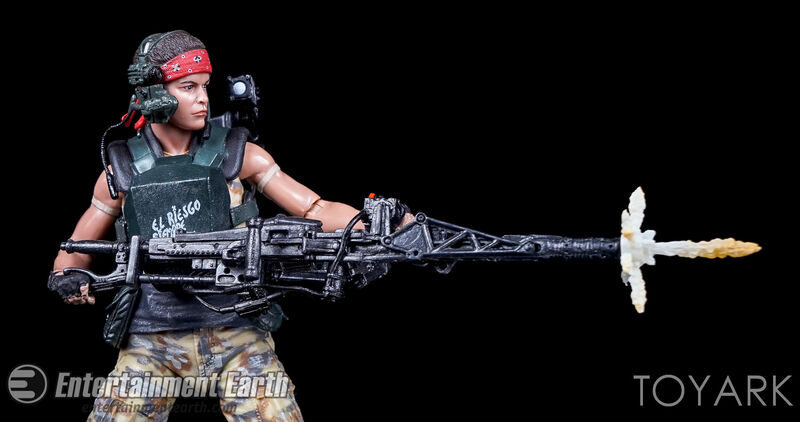 There’s a nice amount of give in the wrists for holding the smartgun. 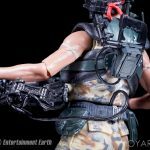 The hands have a tight grip, allowing the figure to hold the smartgun without issue. 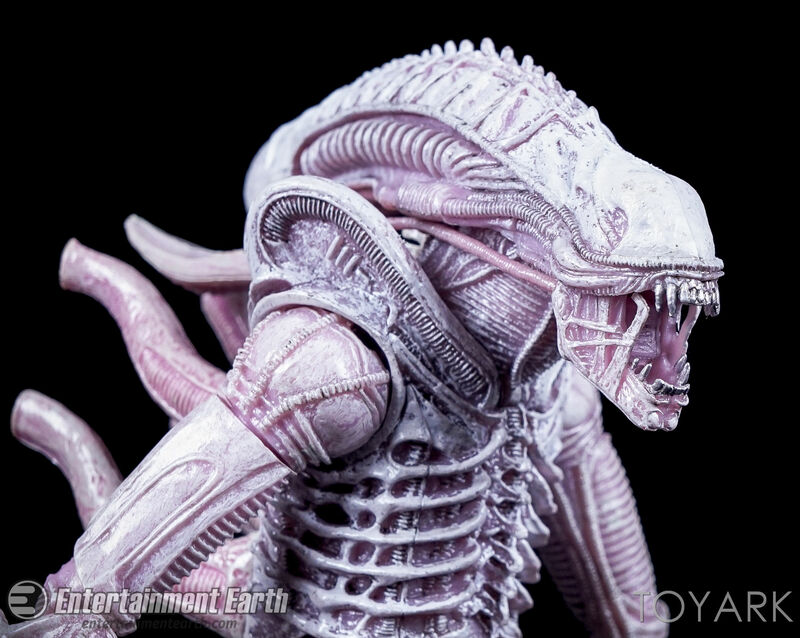 The sculpted details here are excellent. 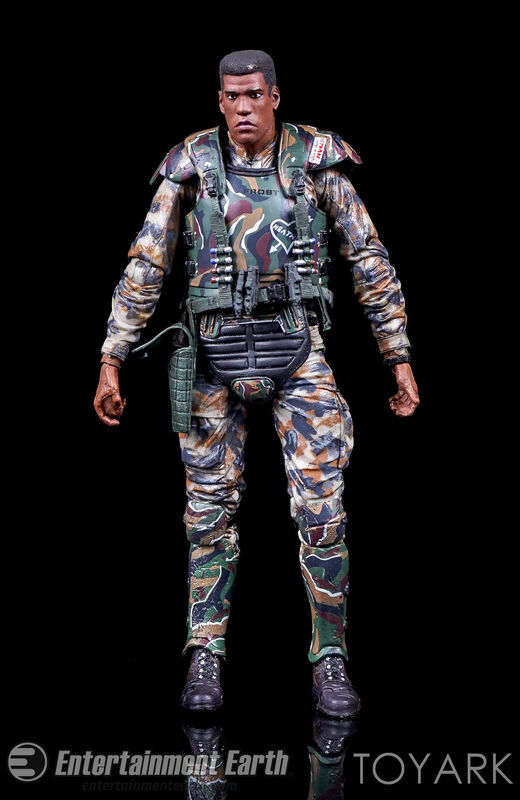 Everything from the head sculpt to the armor to the accessories turned out well. 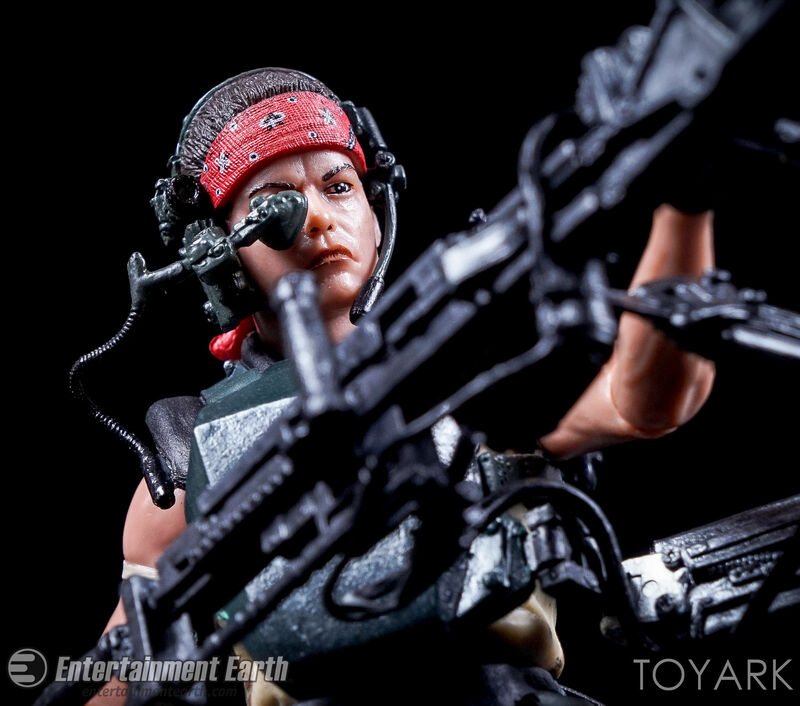 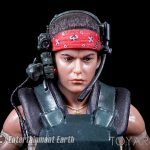 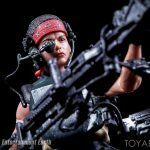 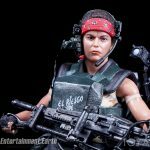 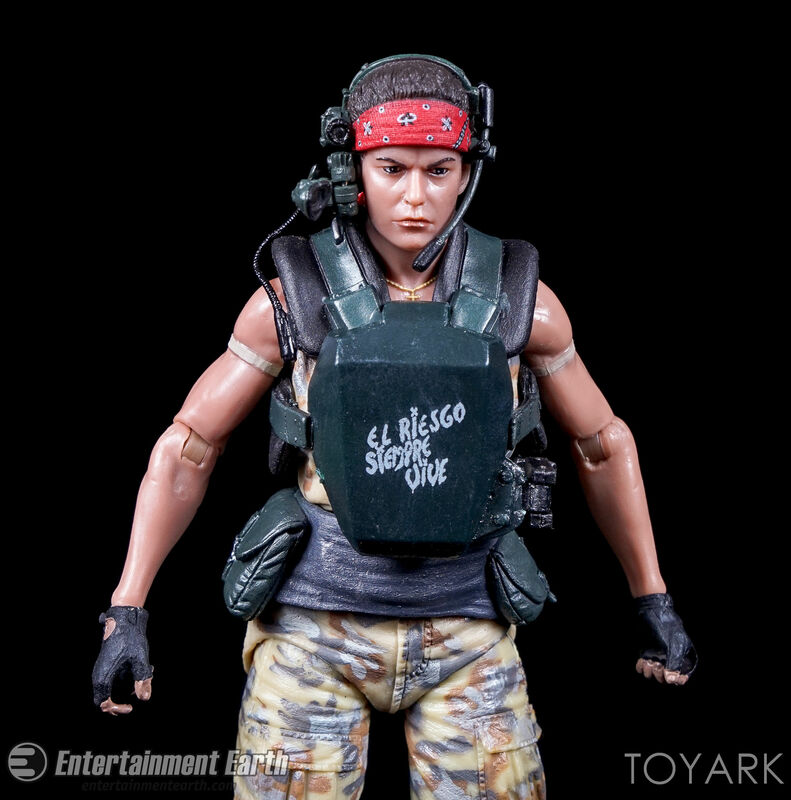 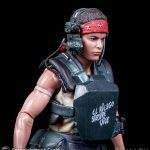 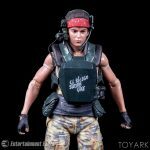 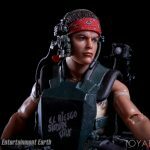 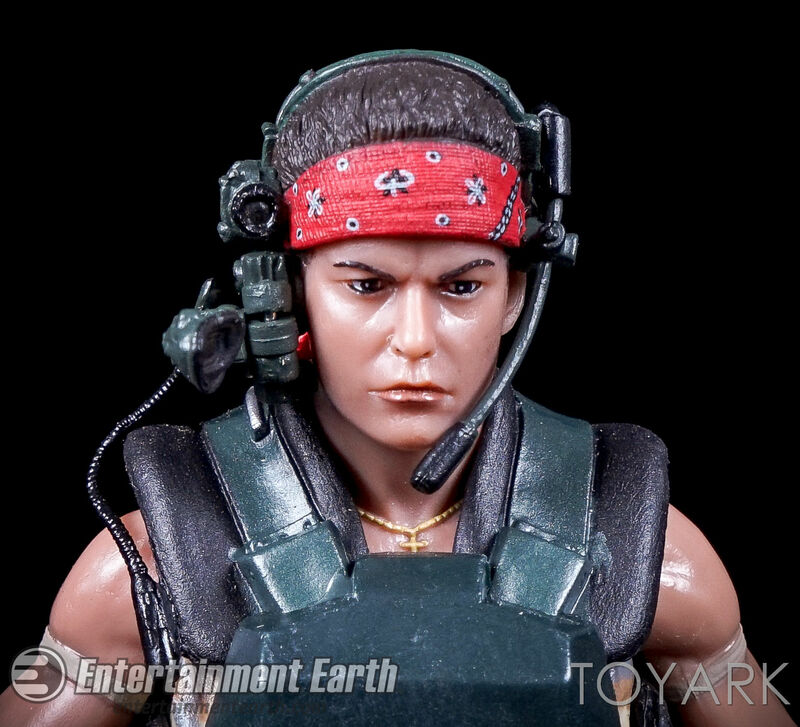 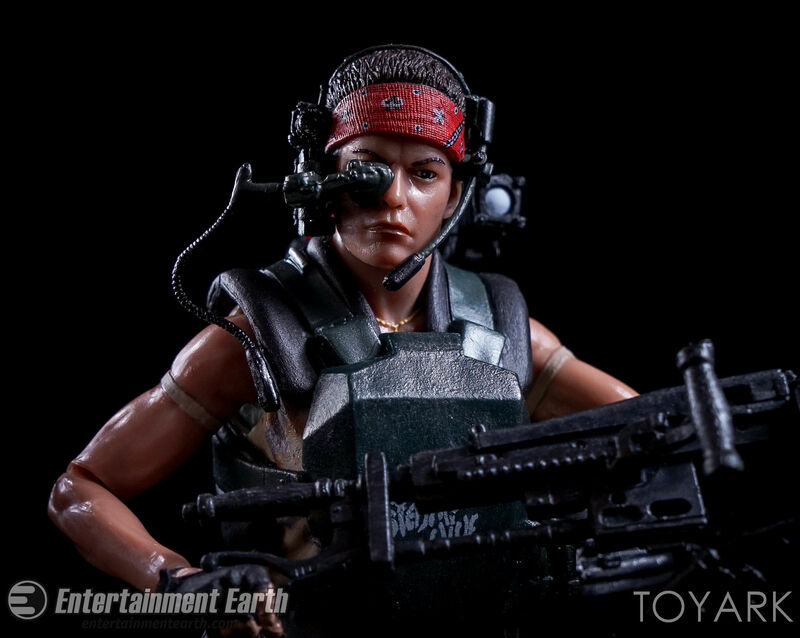 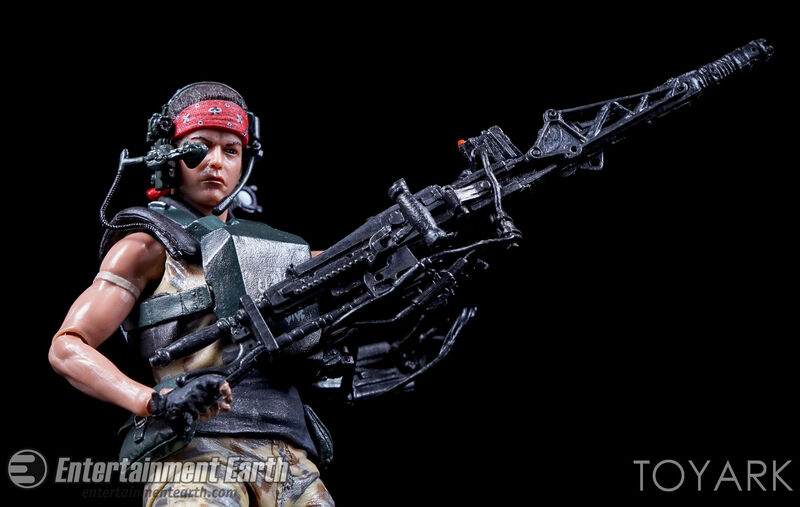 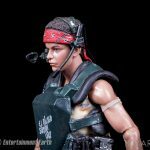 The head sculpt has a good resemblance to actress Jenette Goldstein. 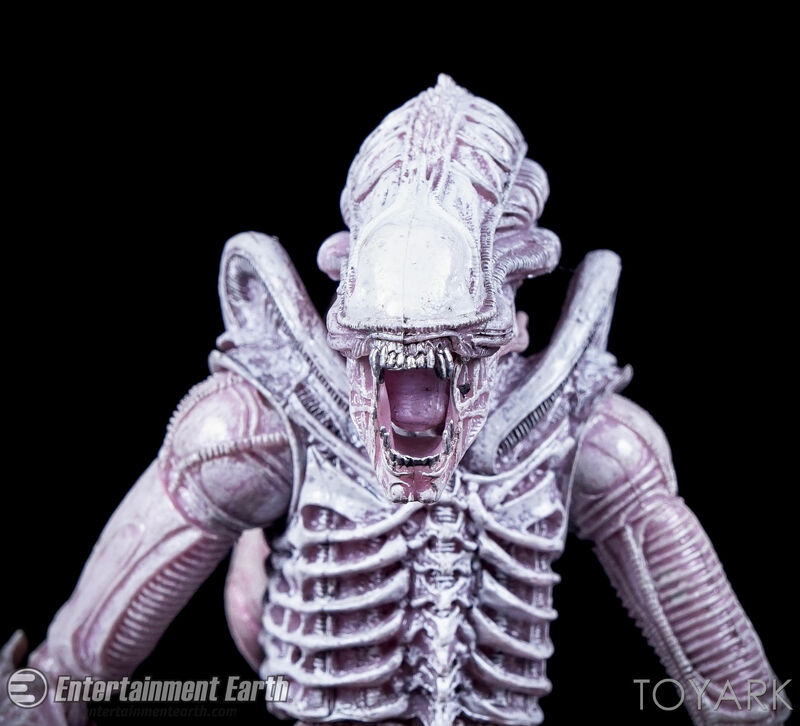 While it’s not quite as detailed at the original prototype, it still holds up quite nicely. 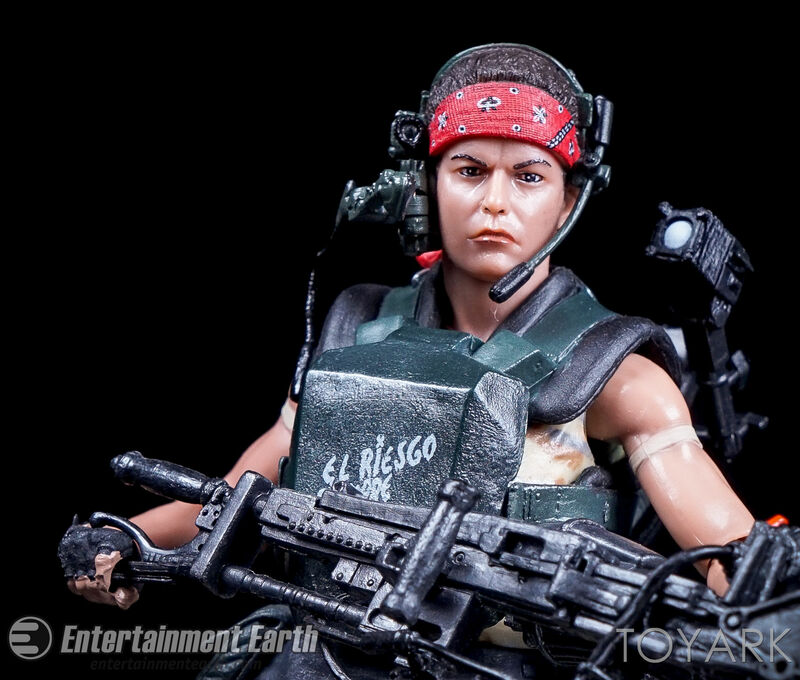 The lone absent detail is the missing teardrop tattoo under her left eye. 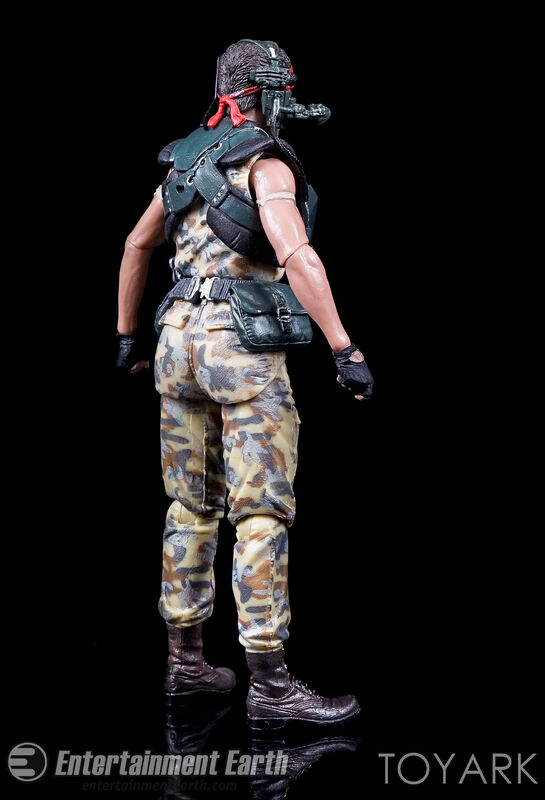 It’s a small detail that likely was a bit too difficult to replicate in the factory. 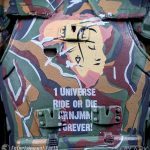 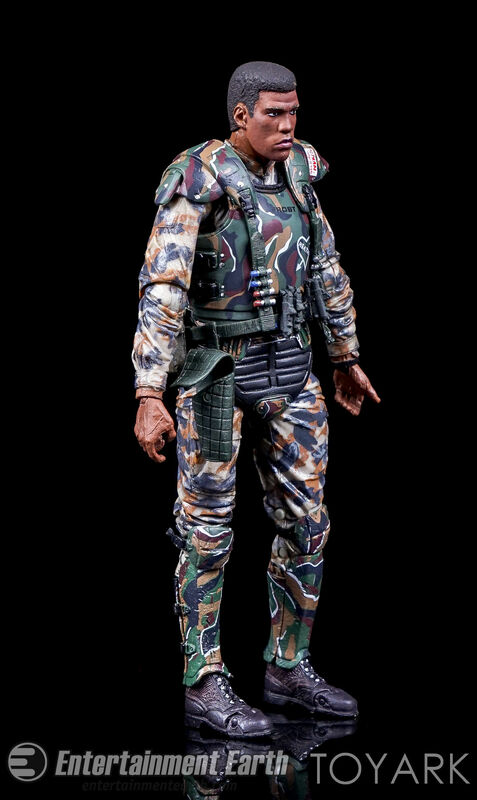 Other paint apps, such as the slogan on the armor, the camo, they eyes, hair, and bandana all work fine. 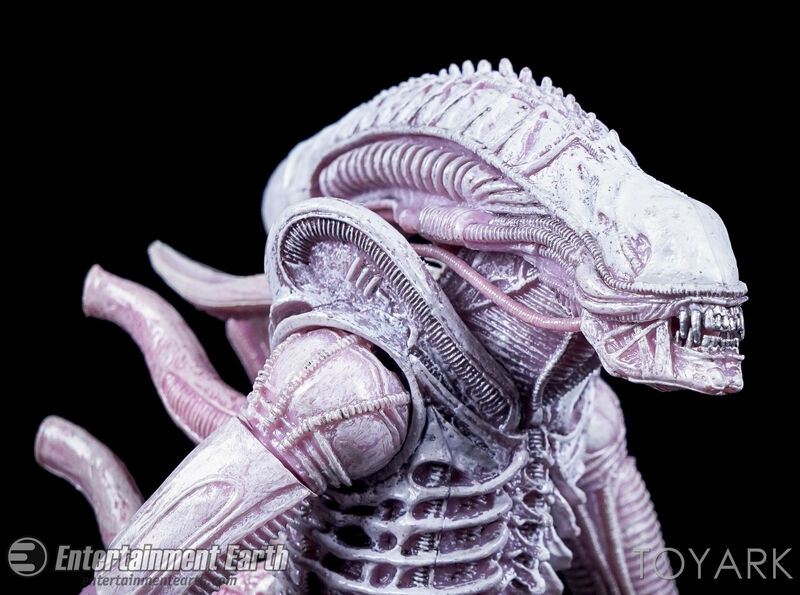 The paint lines are clean with no noticeable paint bleeds. 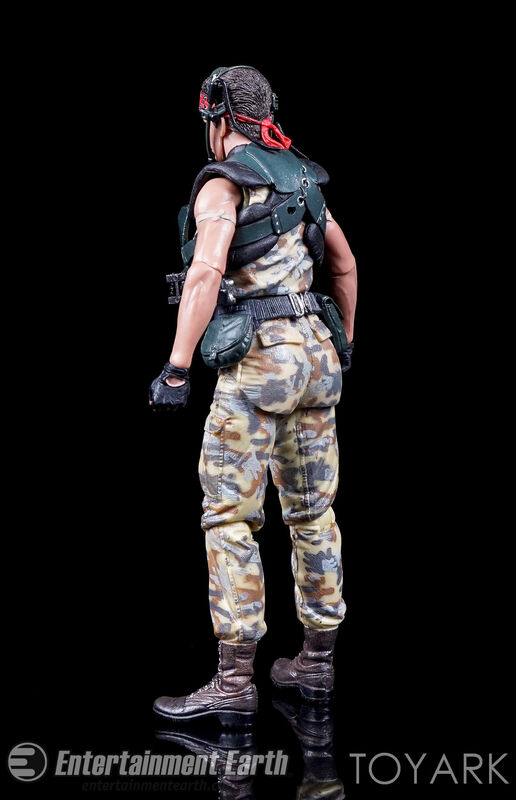 I see one question pop up frequently on the figure. 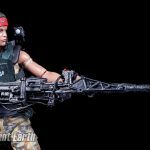 The smartgun has an extra wire and fans are wondering where it goes. 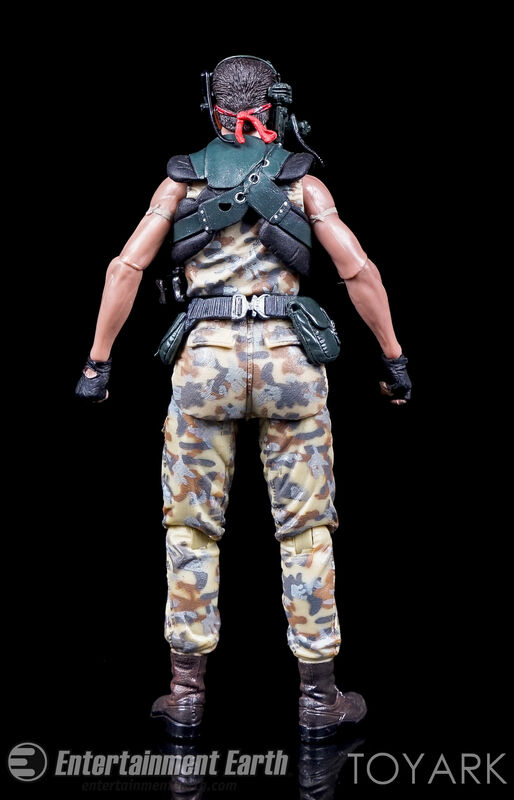 It is meant to be tucked into the back of the belt on the figure. 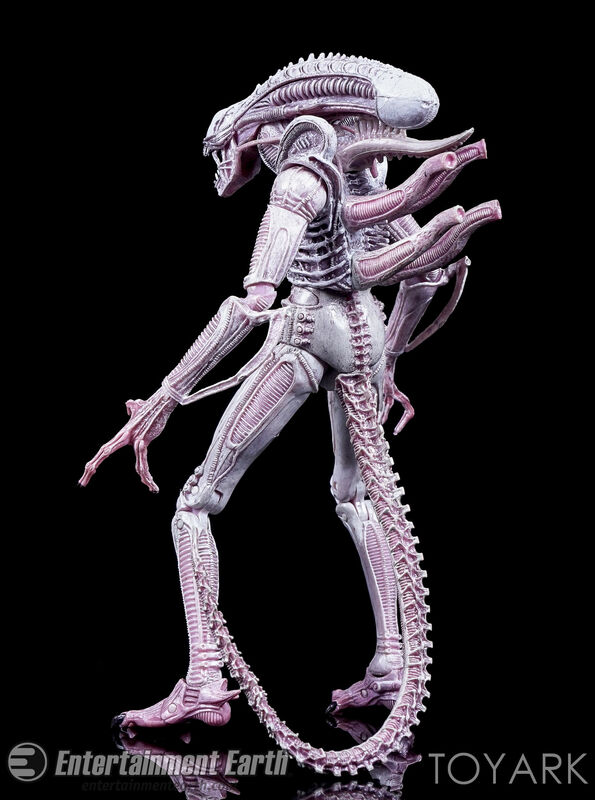 See the gallery for a look at where I placed it. 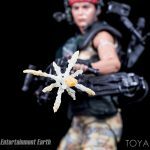 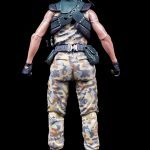 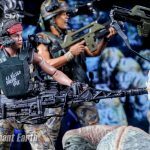 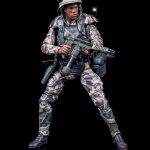 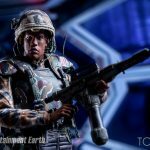 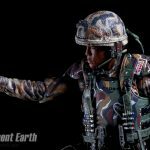 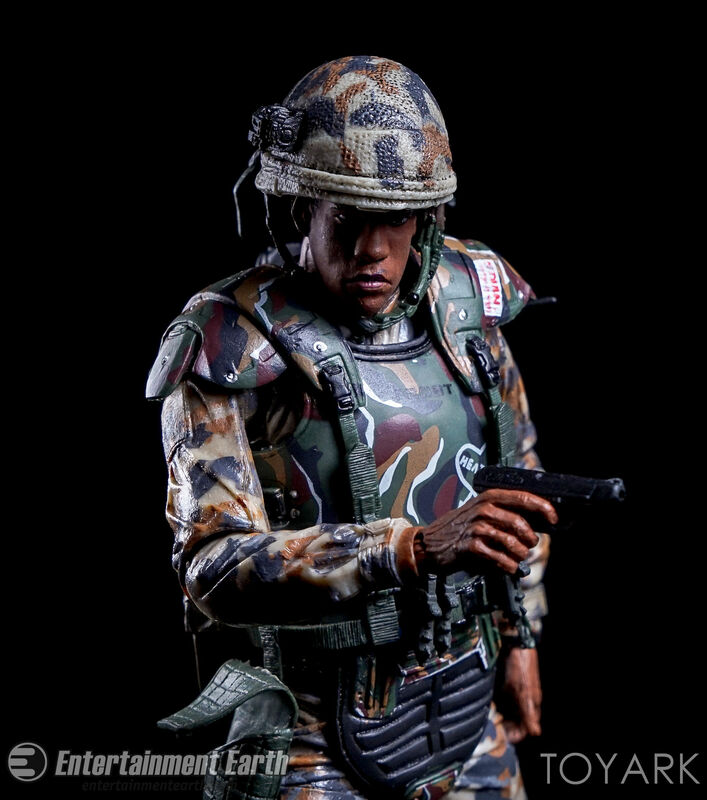 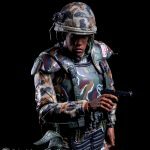 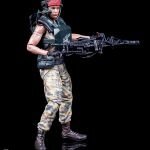 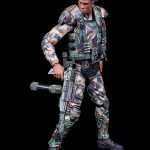 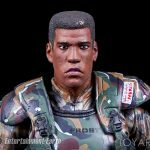 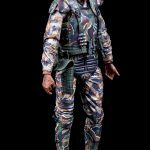 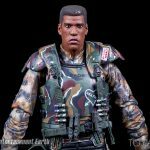 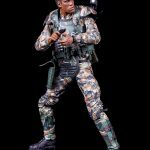 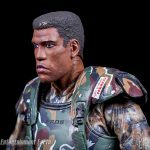 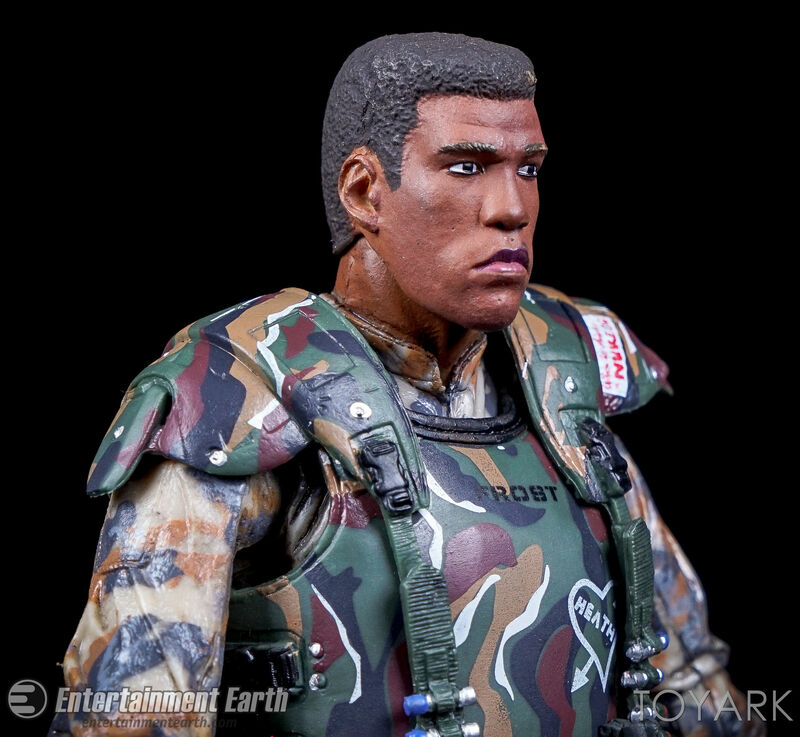 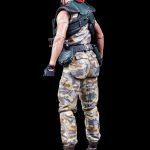 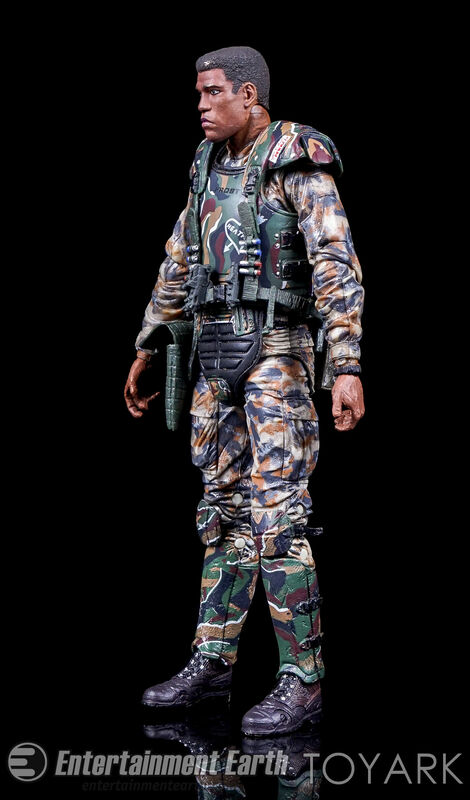 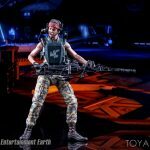 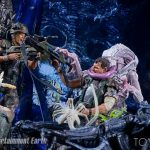 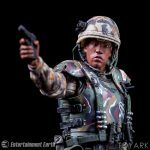 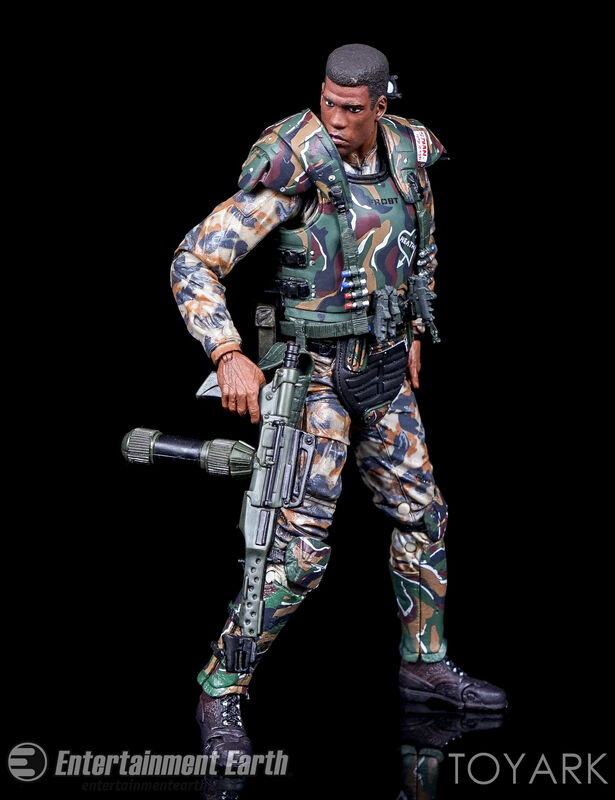 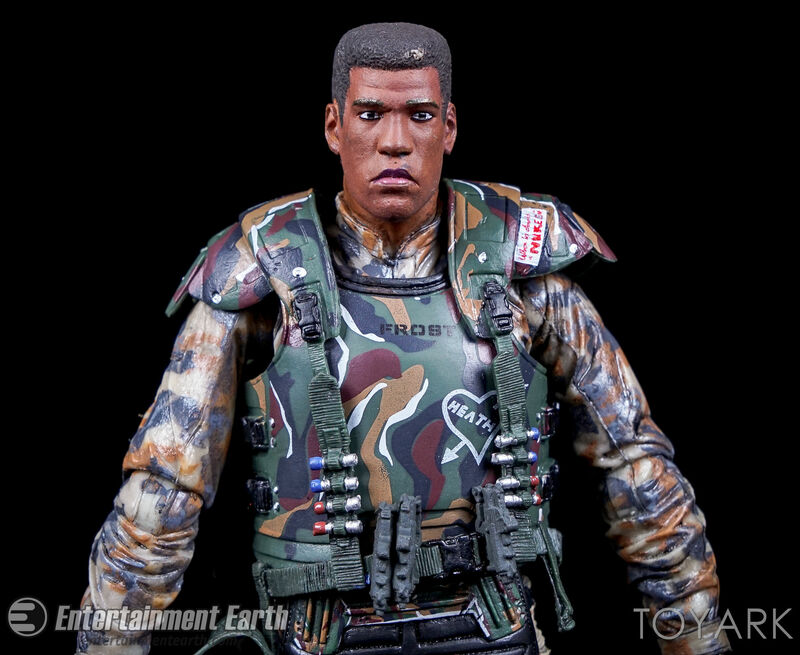 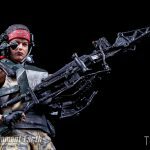 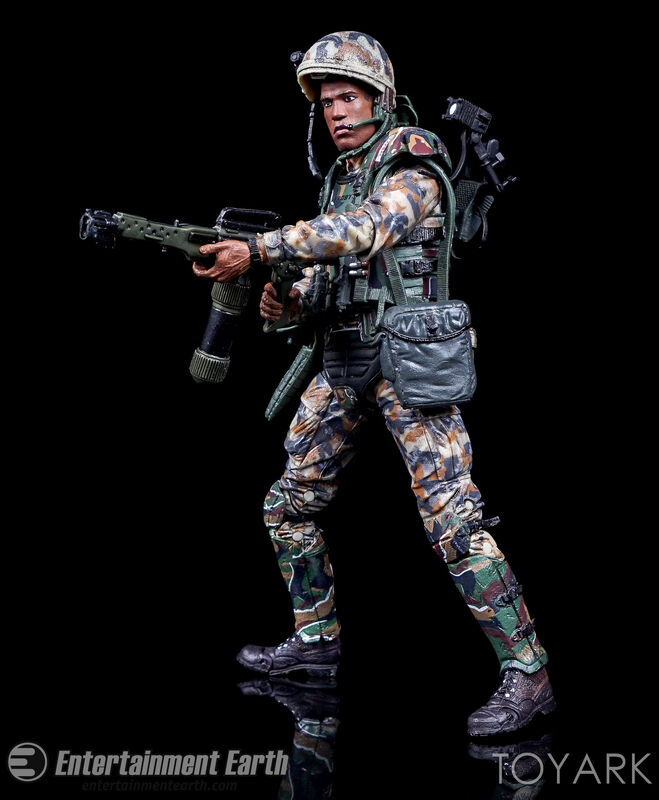 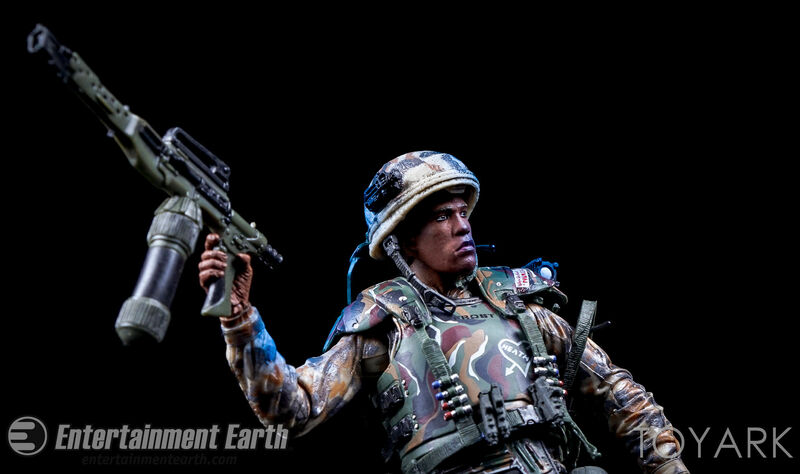 While fans had been clamoring for a Vasquez figure, NECA went one further and brought along another Colonial Marine for fans to enjoy. 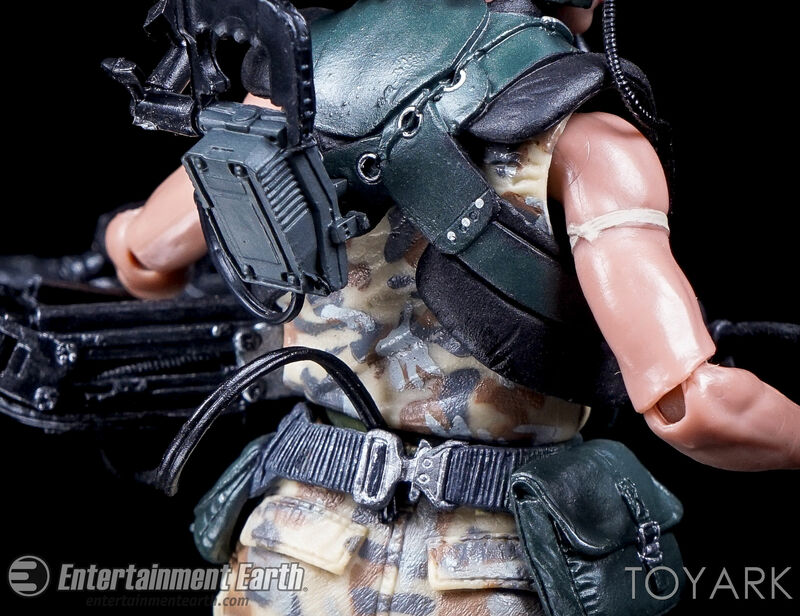 Frosty includes a removable helmet, an ammo bag, a shoulder mounted light, an M240 Flamethrower, and a pistol. 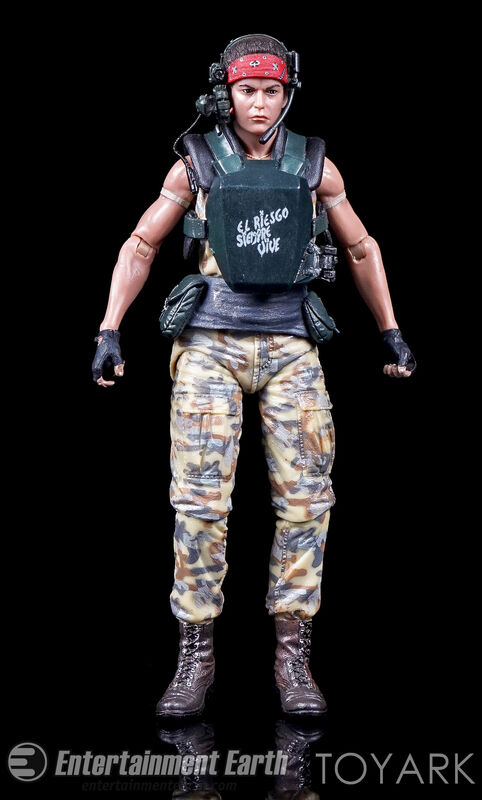 The pistol fits into the functional holster on his hip. 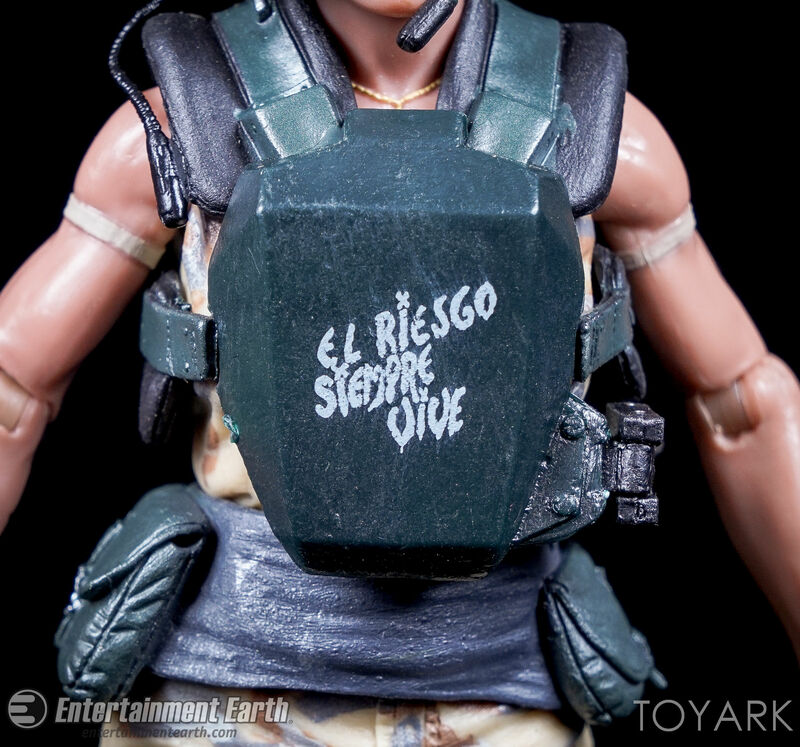 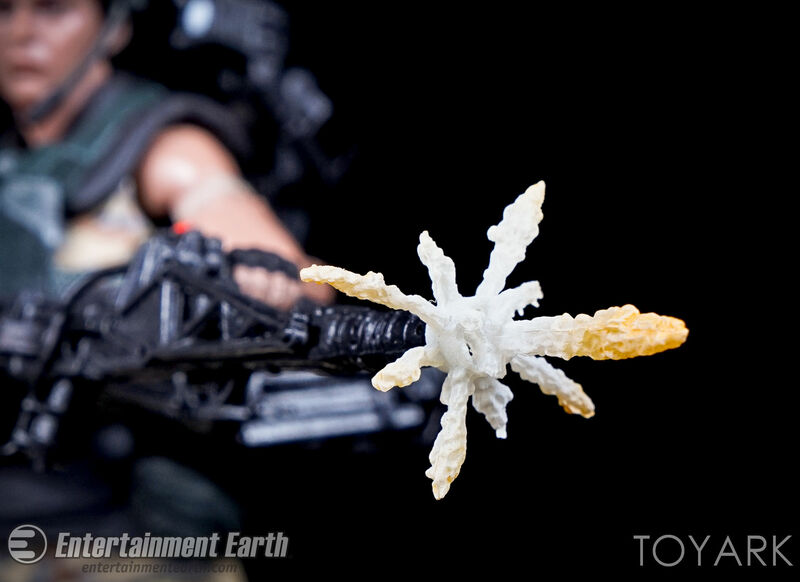 Like Vasquez, the Frost figure includes customized armor based on the film. Frost includes over 25 points of articulation. 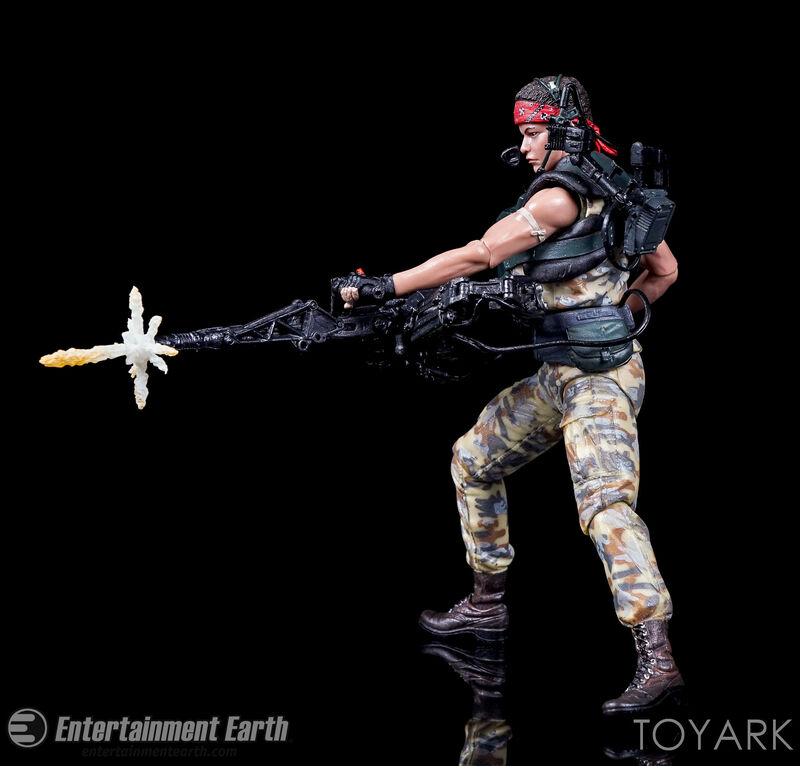 The single jointed elbows have a slightly better than 90 degree rang of motion as well as a swivel bicep allowing for easy posing with both hands holding the flamethrower. 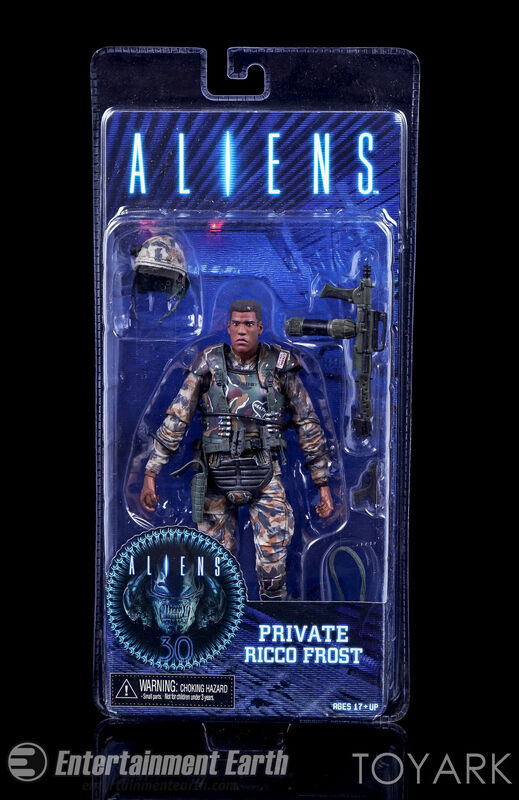 Private Frost features an excellent sculpt. 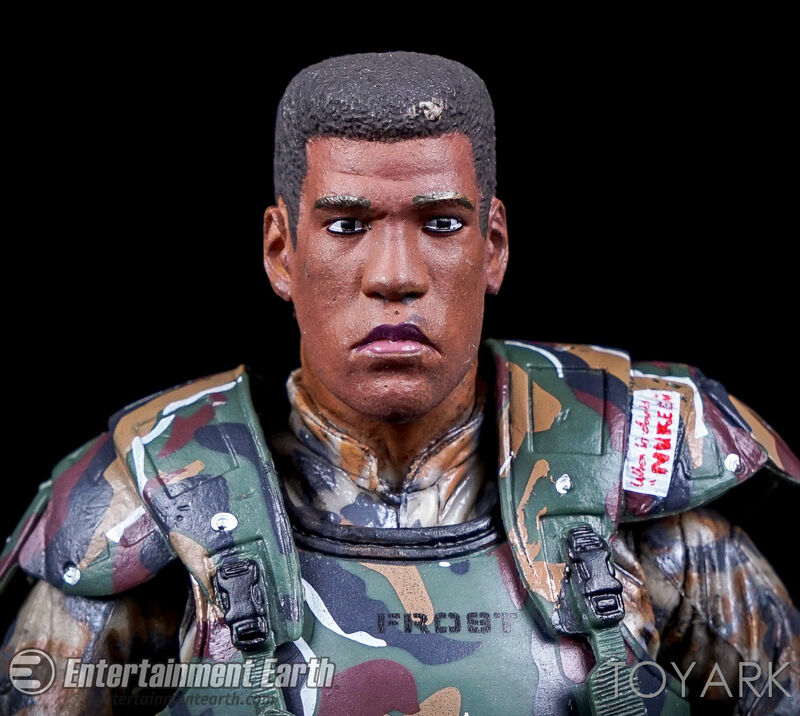 The likeness to actor Ricco Ross is pretty spot on. 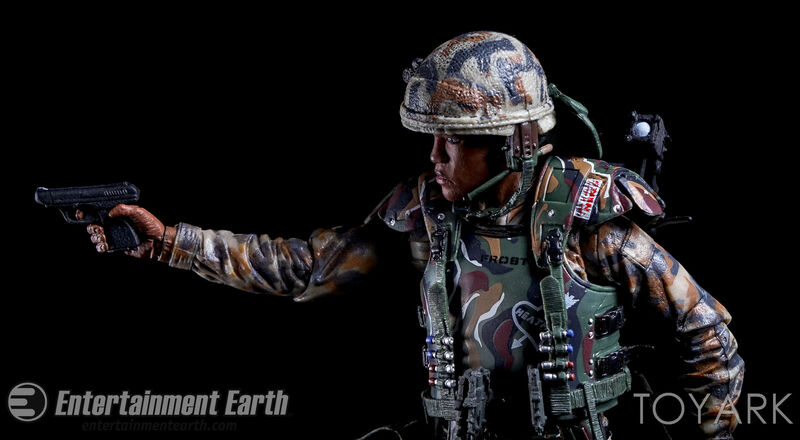 The helmet, armor and weapons feature nice detail work. 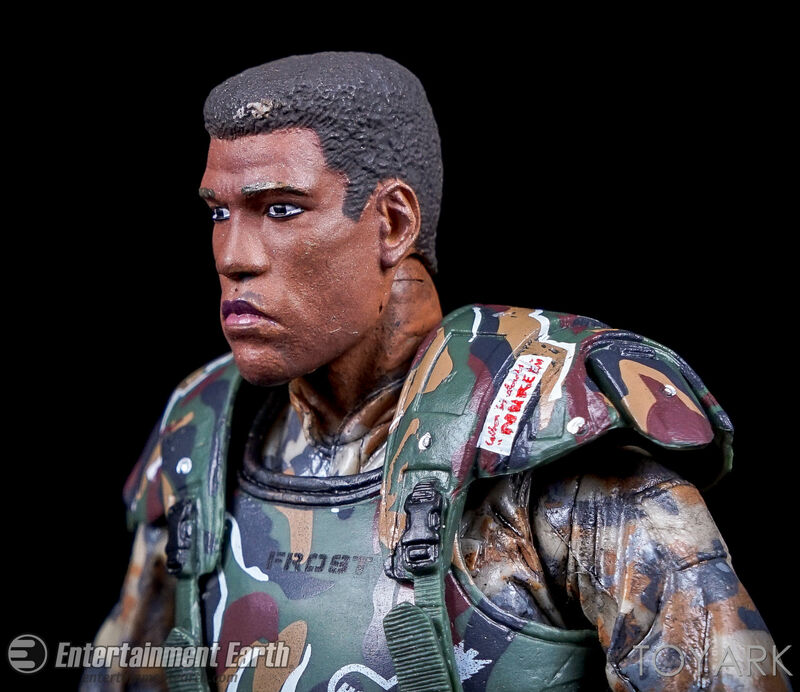 the removable helmet is a nice touch and sits on the head sculpt quite nicely. 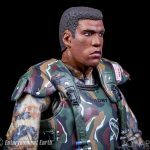 Paint work here is spot on, as the figure features well painted eyes, natural looking skin gradations, and clean paint lines throughout. 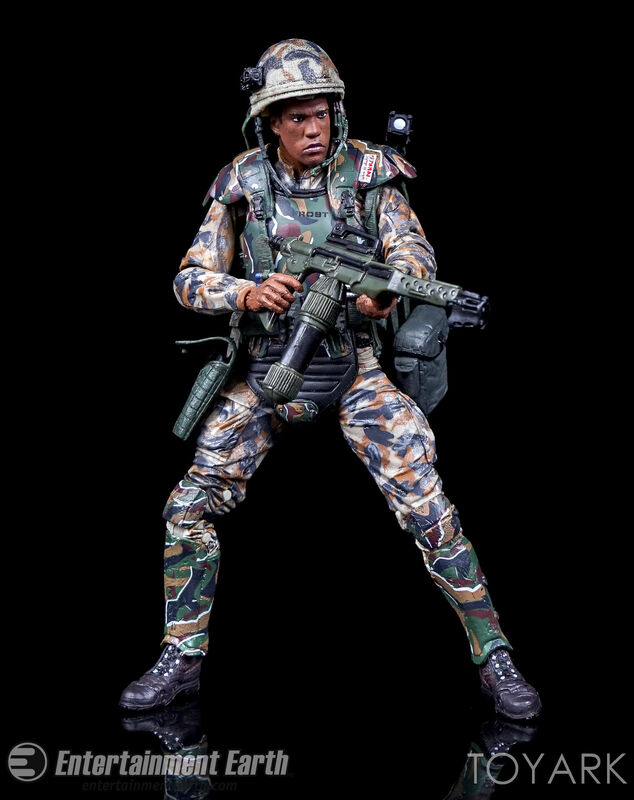 The only gripe is that the shoulder light doesn’t mount to the armor particularly well here. 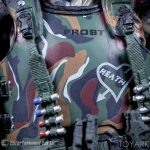 The armor is thinner, so you have to do some maneuvering to get it to stay in place. 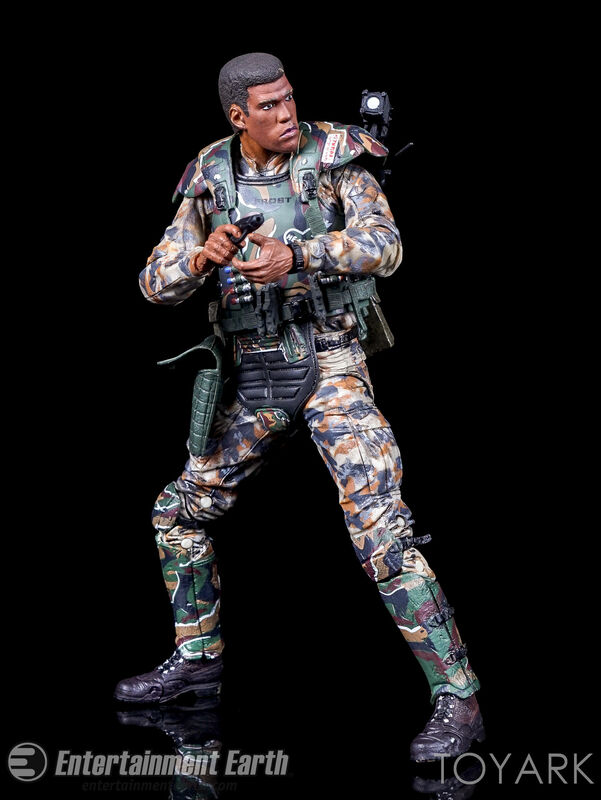 The ammo back can easily be thrown over his shoulder and the pistol can be stored in the holster. 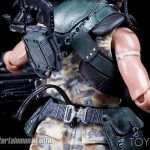 The holster features a functional clasp to secure the gun. 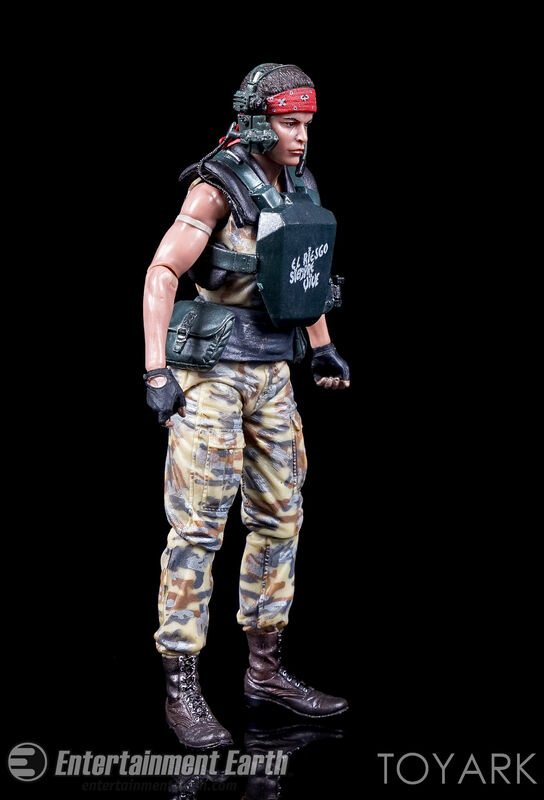 Everything comes together nicely here for a great overall figure with some really good accessories. 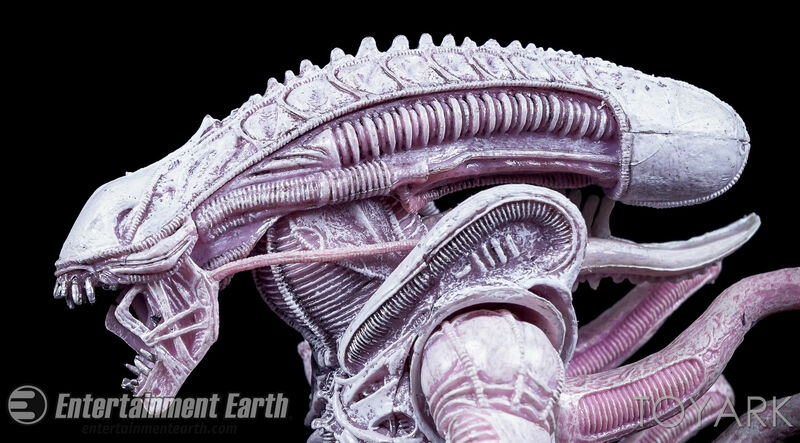 When James Cameron was developing Aliens, he had plans to revisit a concept that was dropped for the original Alien. 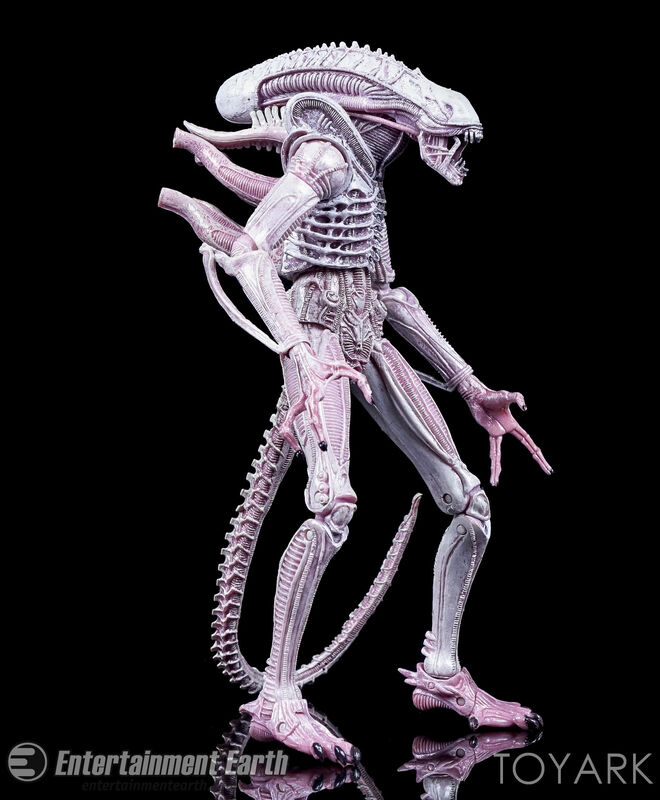 In that case, Kane’s Son (aka the Big Chap Alien), was meant to be translucent white. 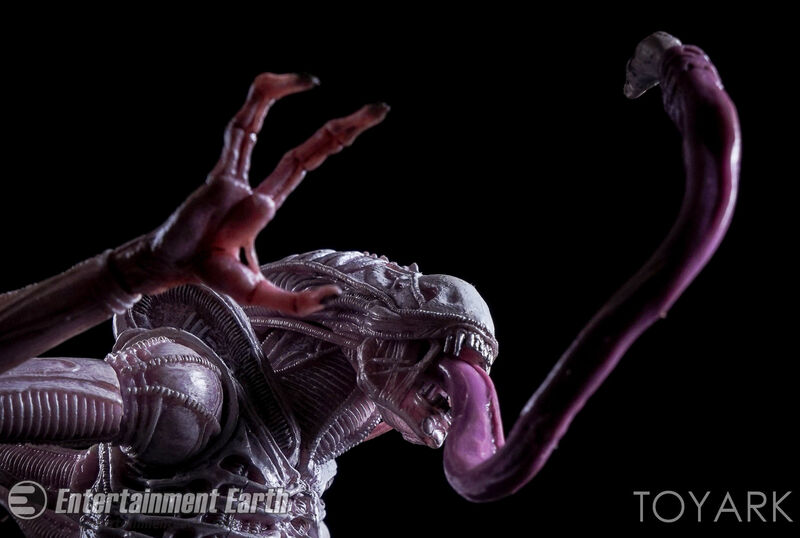 the effects team couldn’t get it to look correct then and it was dropped. 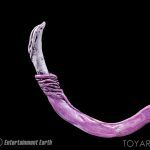 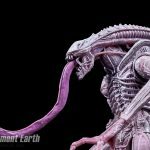 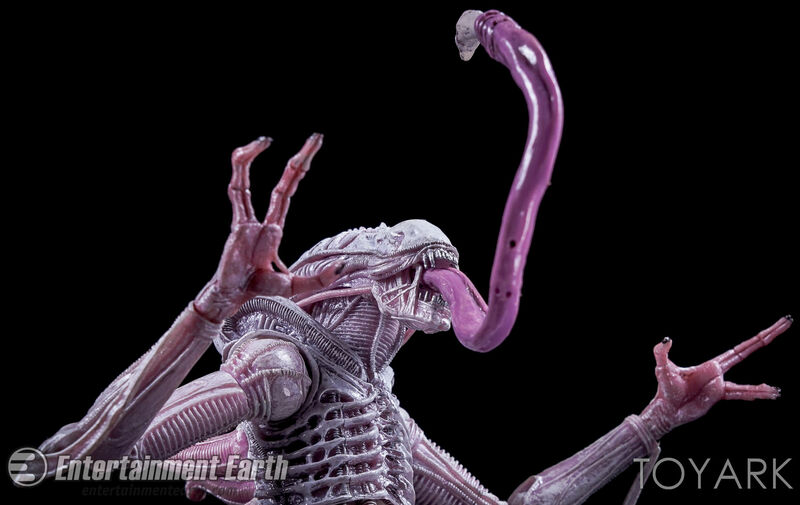 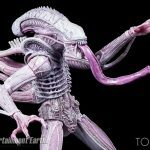 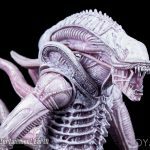 When working on the designs for Aliens, Cameron wanted to revisit the Albino Alien, and replace the extending inner jaw with a tentacle-like probe. 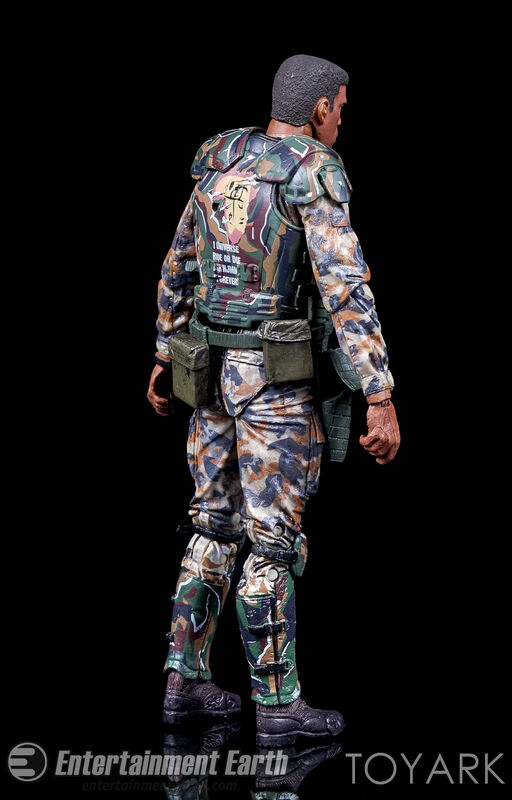 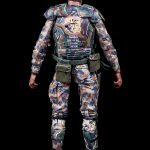 The concept was ultimately dropped in favor of the look we see on screen. 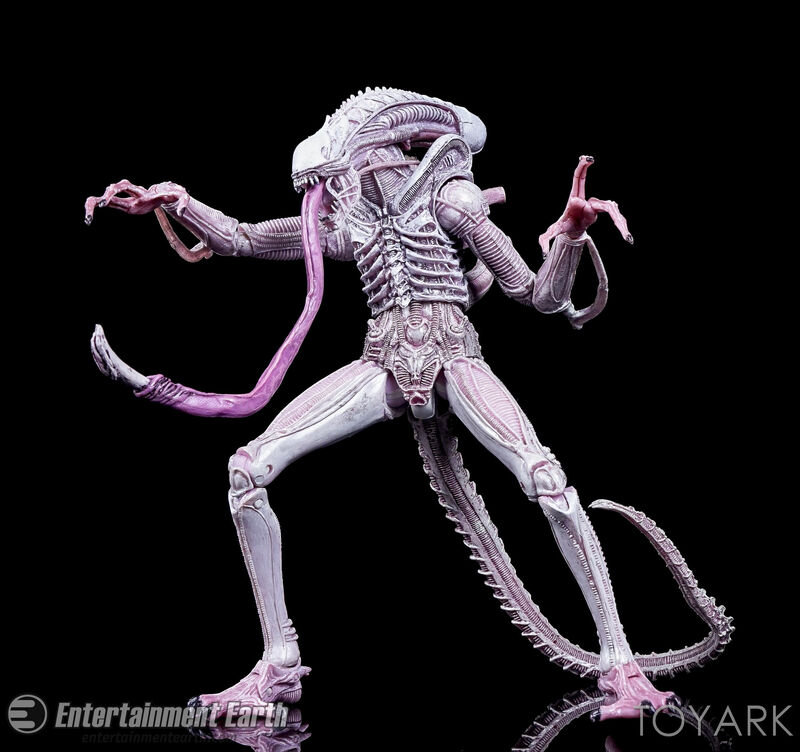 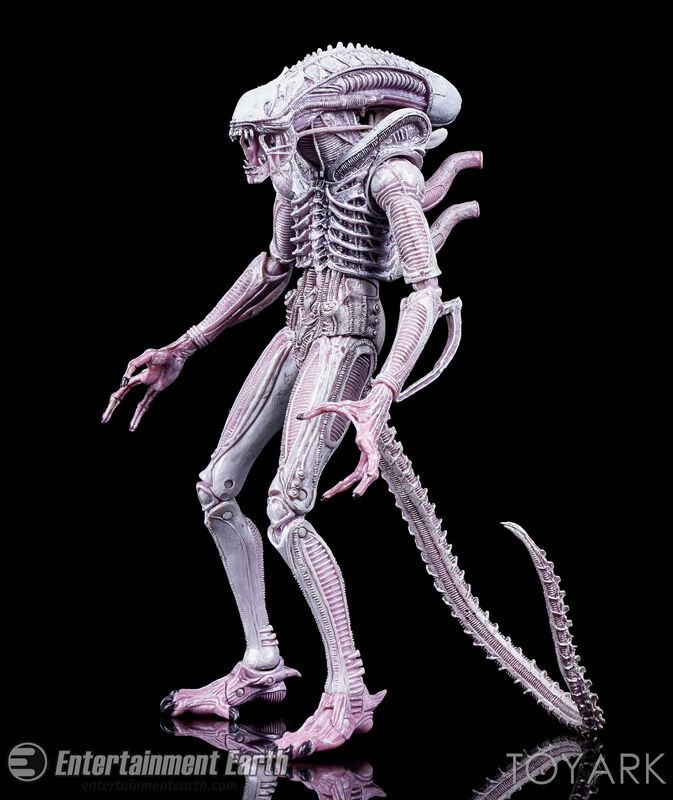 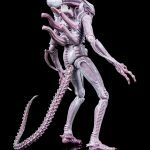 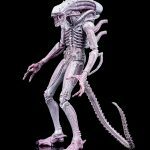 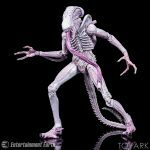 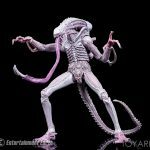 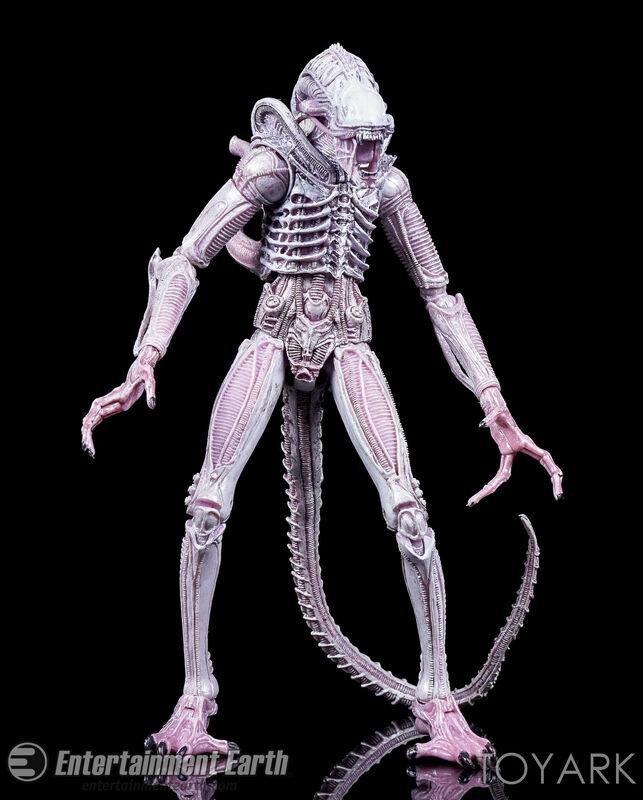 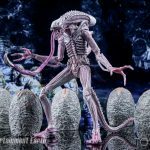 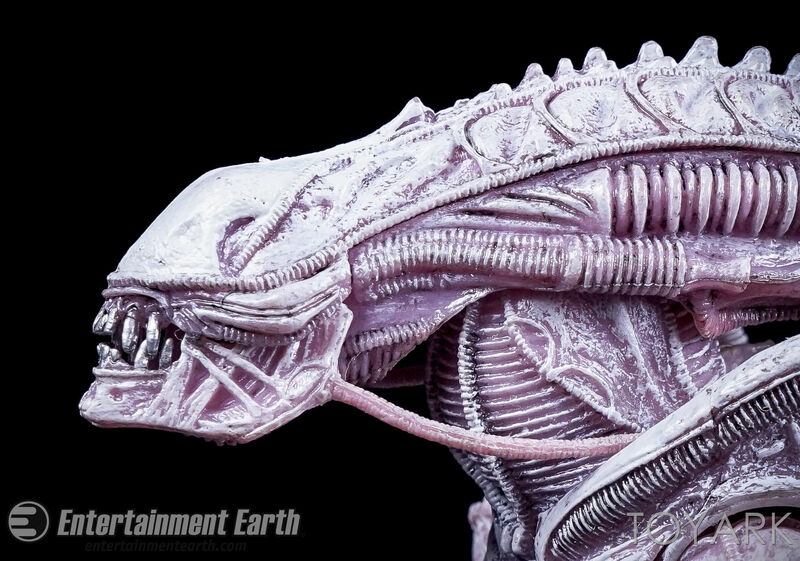 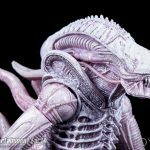 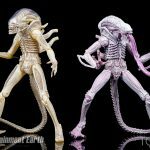 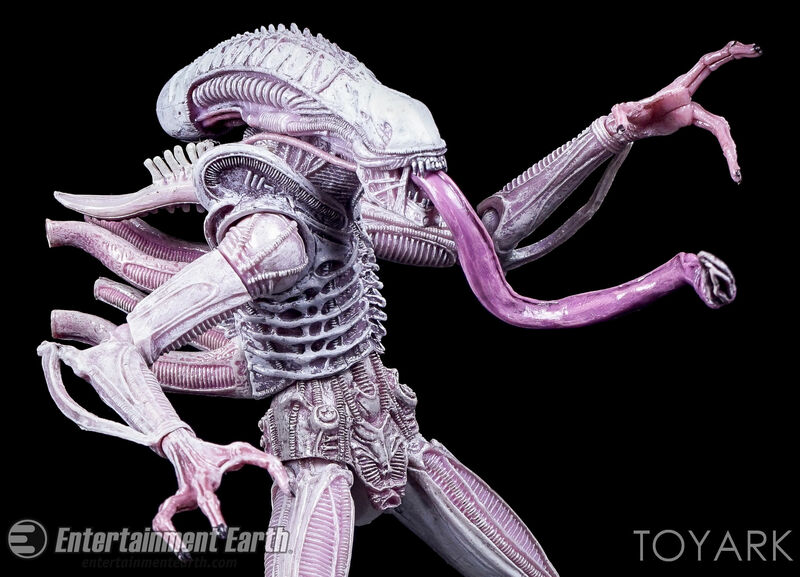 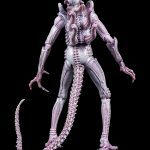 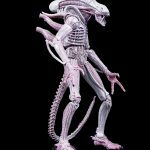 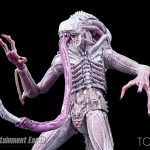 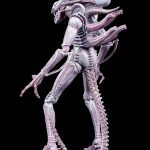 This is NECA’s second concept series Alien figure, having released a concept Albino Big Chap already. 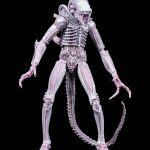 The figure uses the popular, and excellent Alien Warrior as it’s base figure. 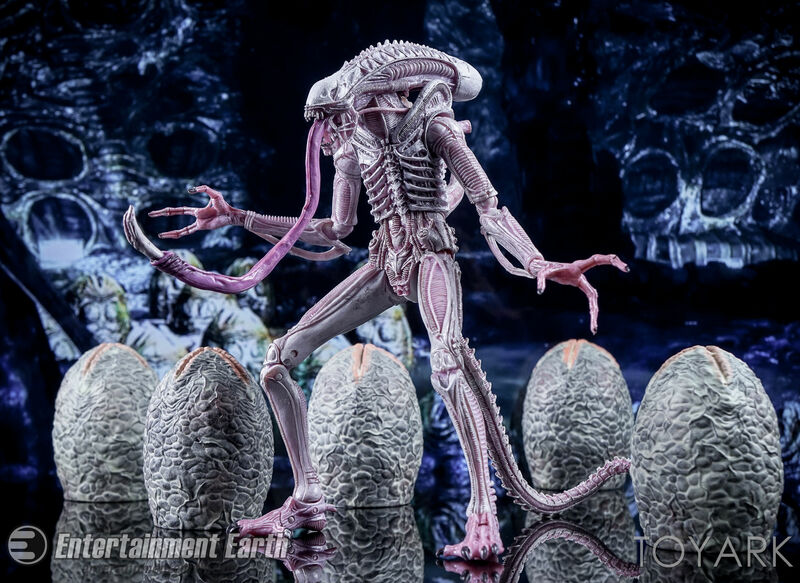 Unlike the translucent yellow-ish color of the Albino Big Chap, NECA went for a more opaque color scheme. 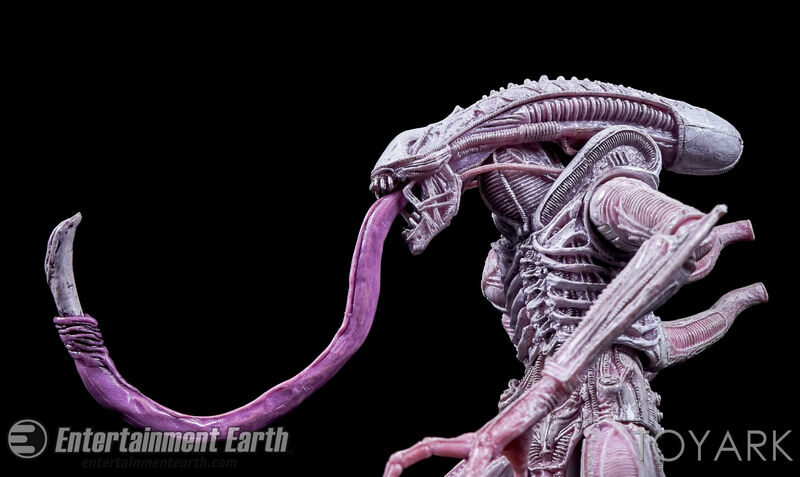 The white is accented with wonderfully subtle pink and purple washes throughout. 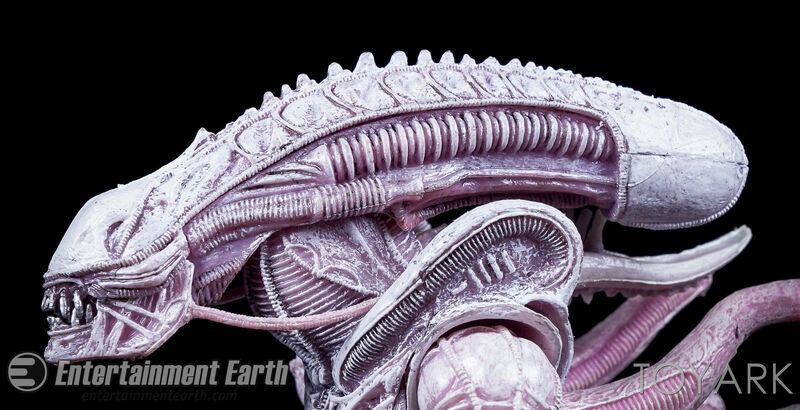 There are also bits of metallic silver, such as the teeth. While the brighter colors are noticeable, it’s handled with restraint, allowing the Albino look to really shine here. 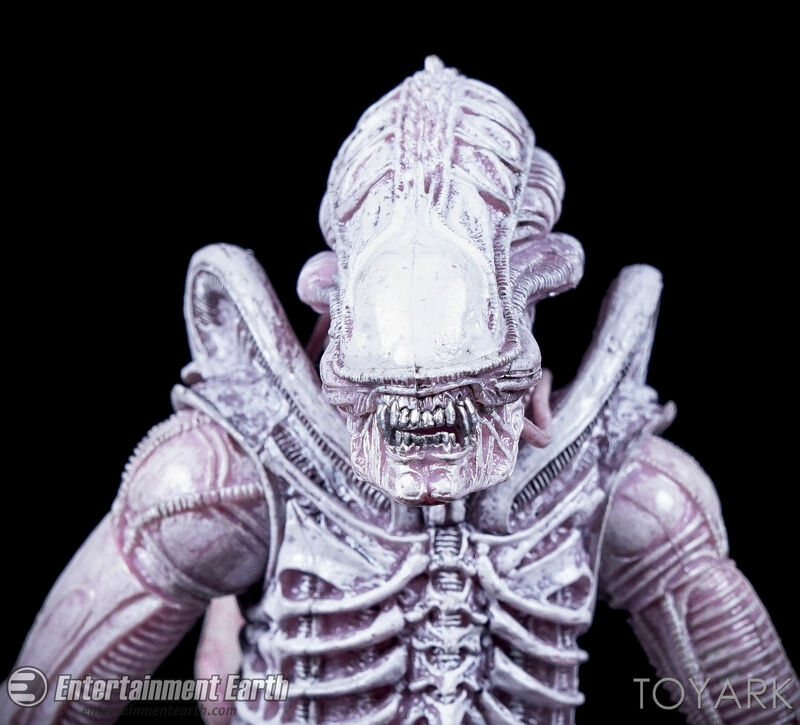 On top of that, NECA has removed the inner jaw, replacing it with a bendable probe with a stinger on the end. It fits snugly in the space for the inner jaw and stays in place without any troubles. 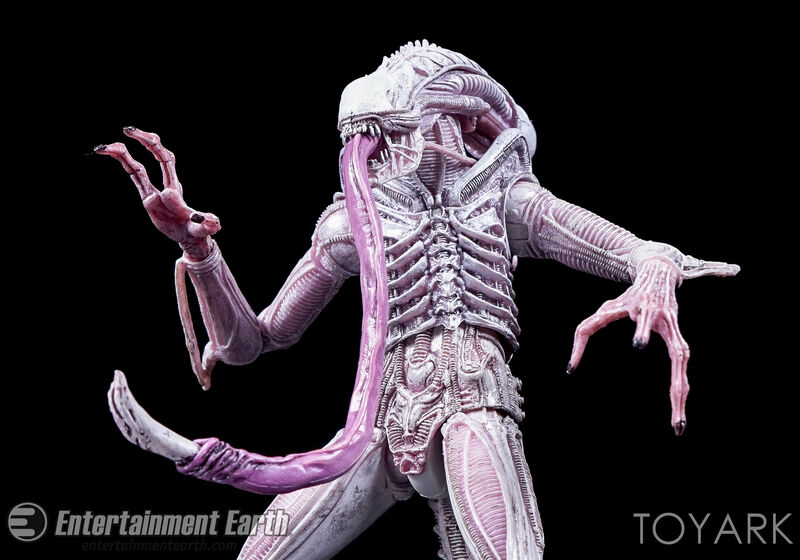 The figure is equal parts beautiful and creepy. 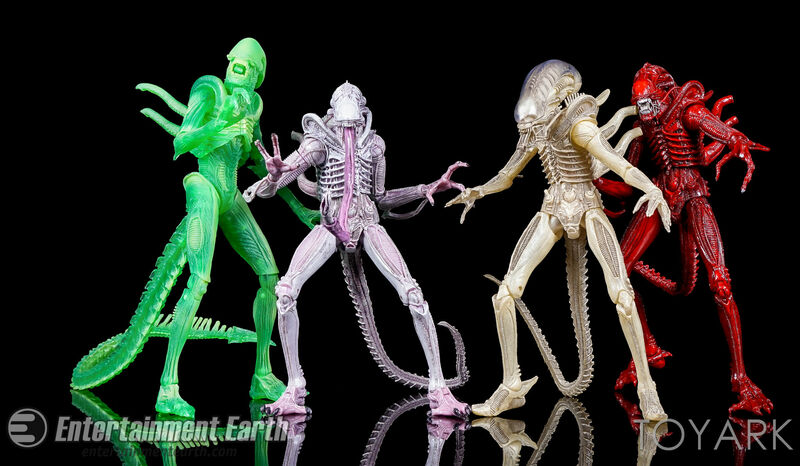 This assortment of Aliens is a great celebration of the 30th anniversary. 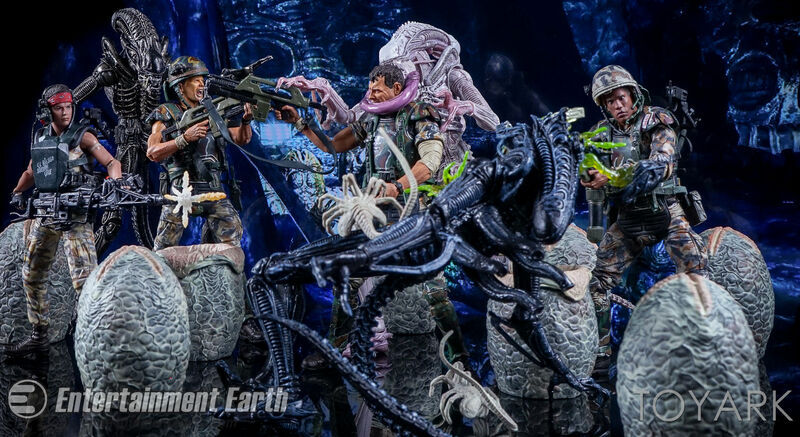 All three releases are strong additions to the line up. 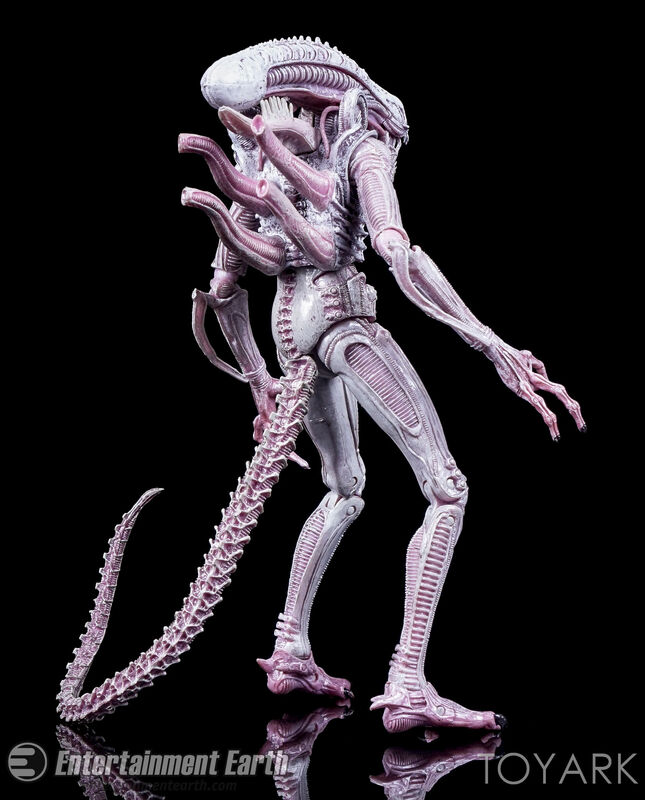 The Albino Drone makes a great Xenomorph army builder, while Vasquez and Frost now allow collectors to have a more fleshed out crew of Colonial Marines. 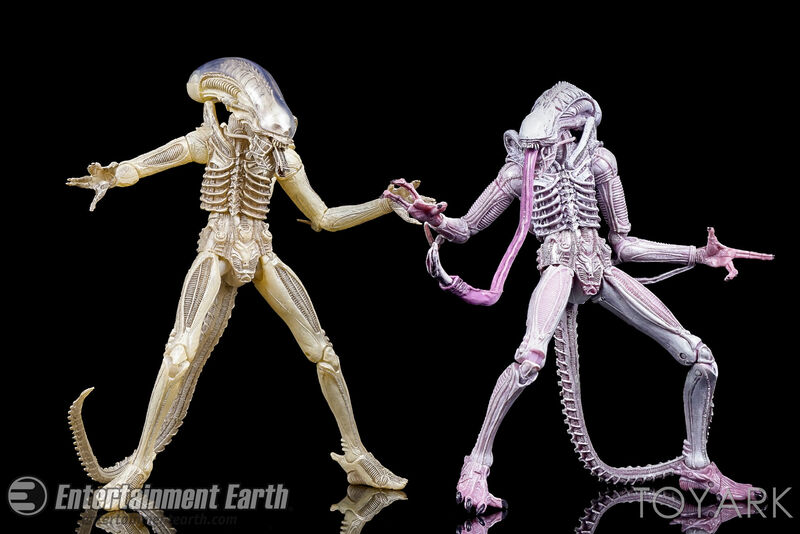 These figures are in stores now. 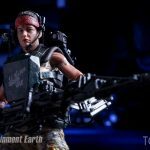 Check out a few highlight photos below. 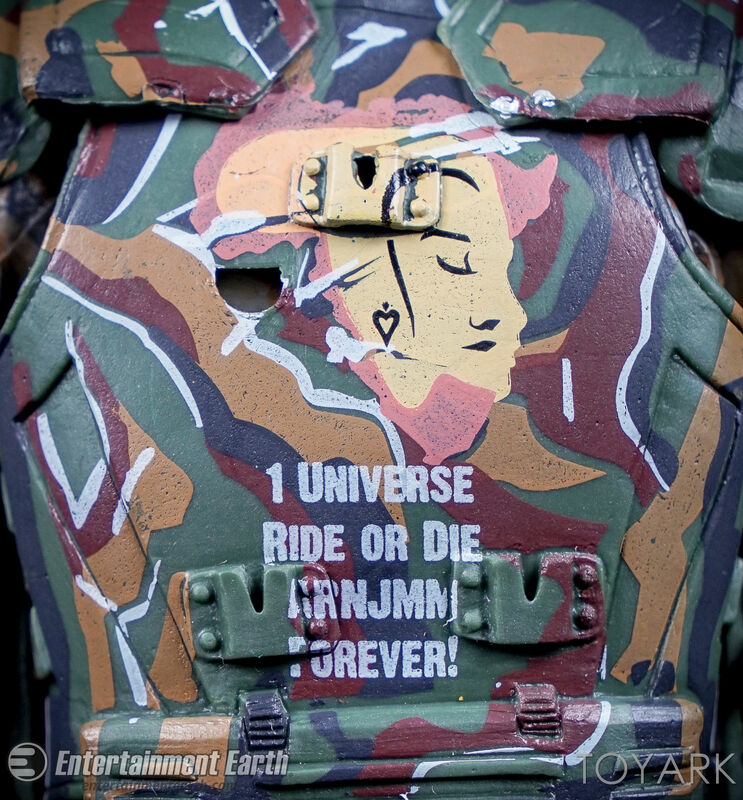 After that, you can see the full gallery of over 100 photos. 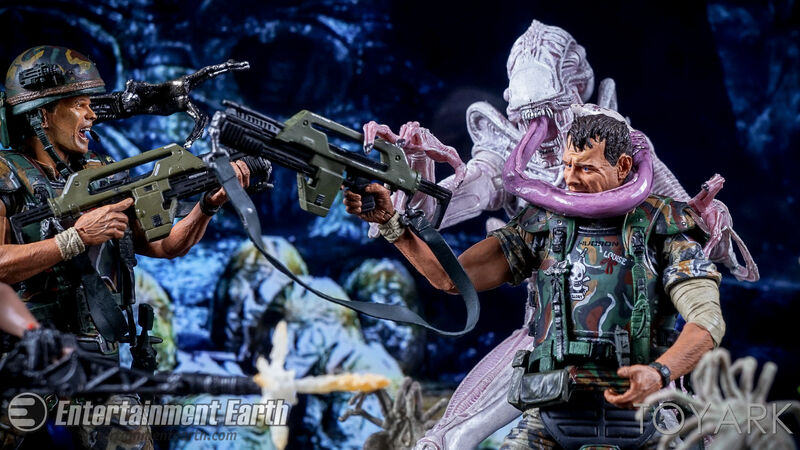 Man those sculpts are amazing! 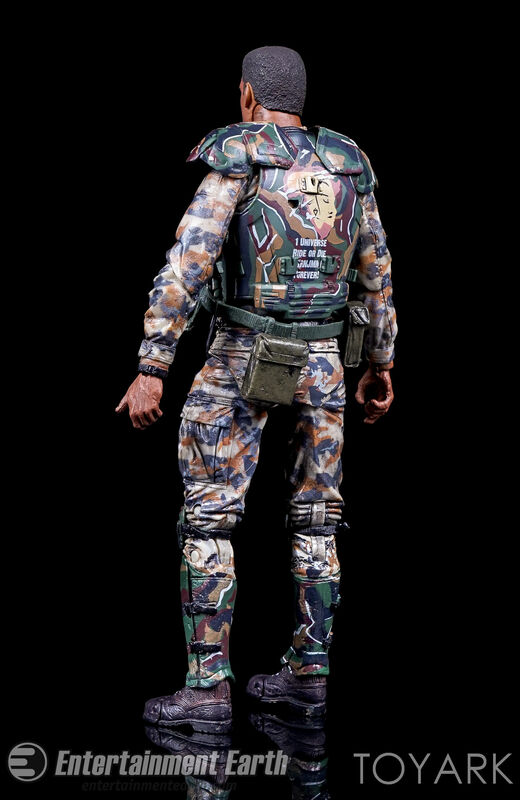 NECA keeps getting better and better at this and their paint app. 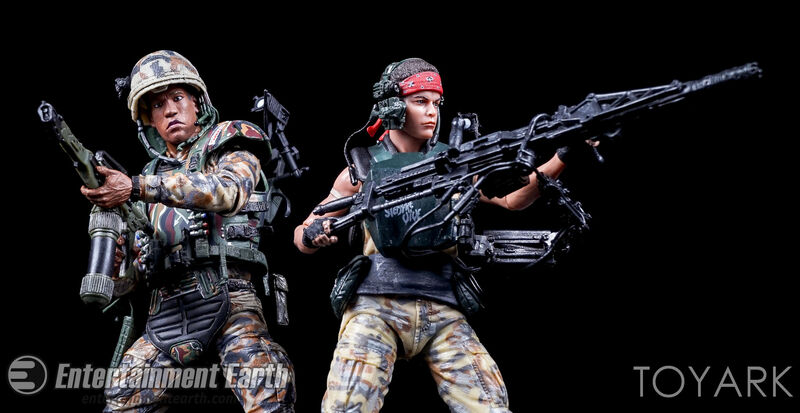 Vasquez is a no-brainer for me, and Frost just looks so badass. 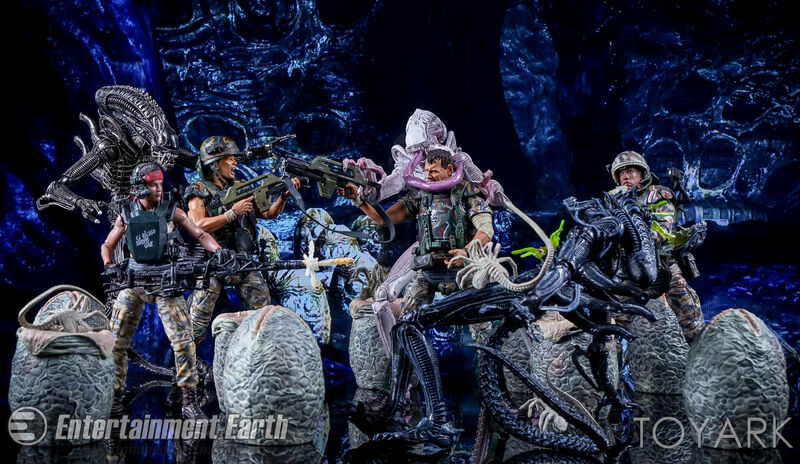 Can't have enough Colonial Marines. 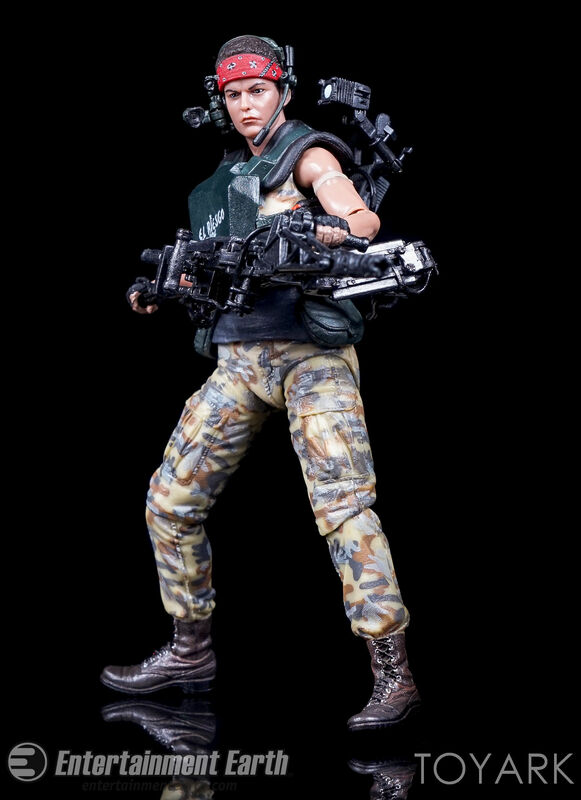 Joe's best photo shoot ever. 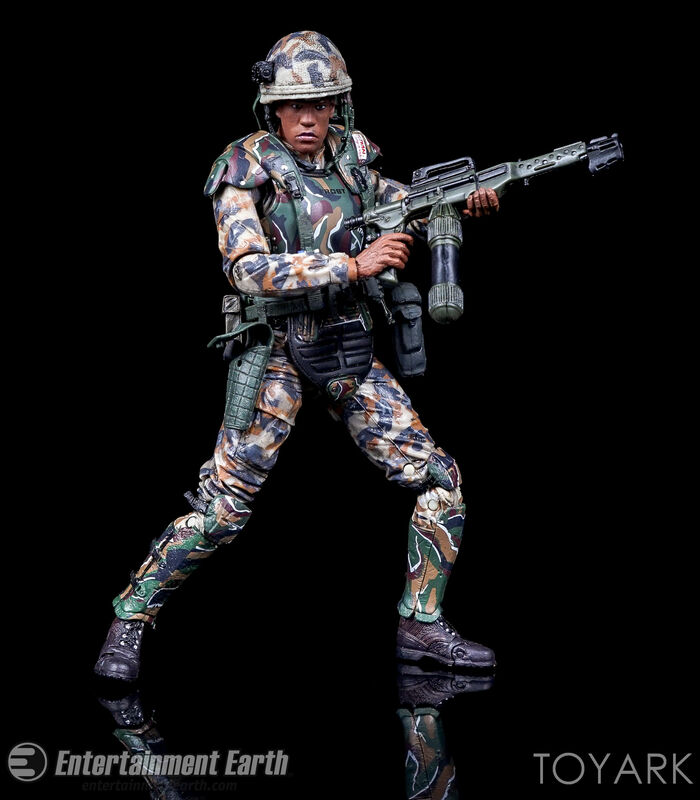 And this wave is a must-buy for me. 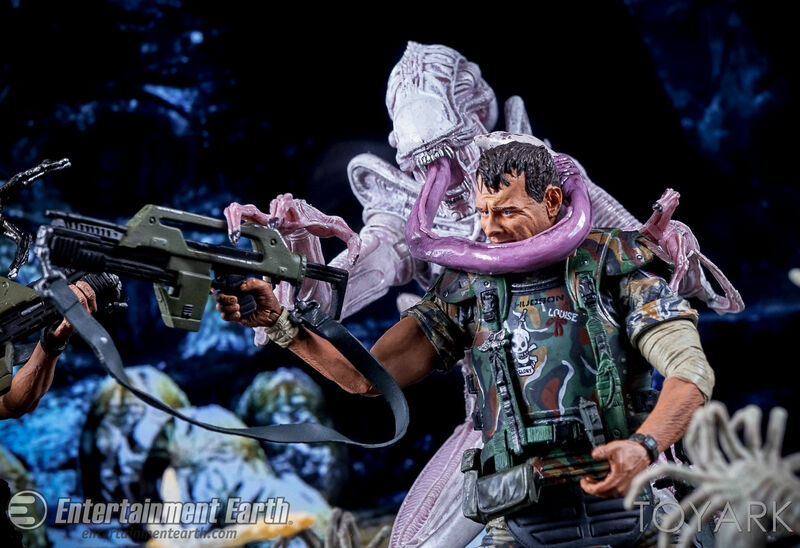 Vasquez is awesome and the albino drone is equal parts horrifying and gorgeous. 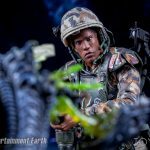 Outstanding photos. 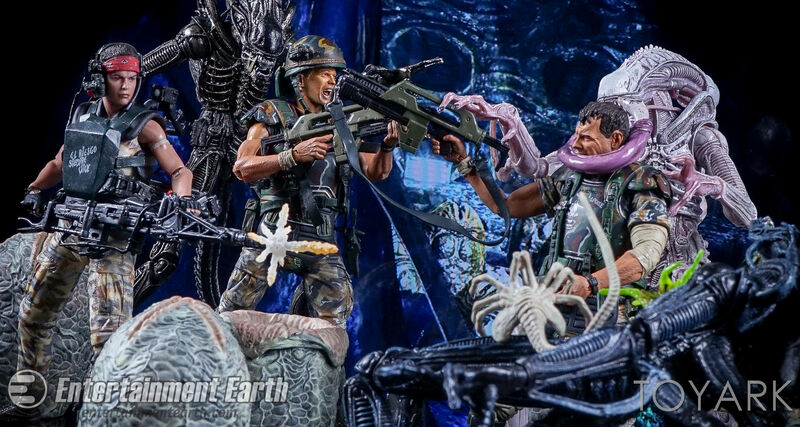 Must have been fun to shoot. 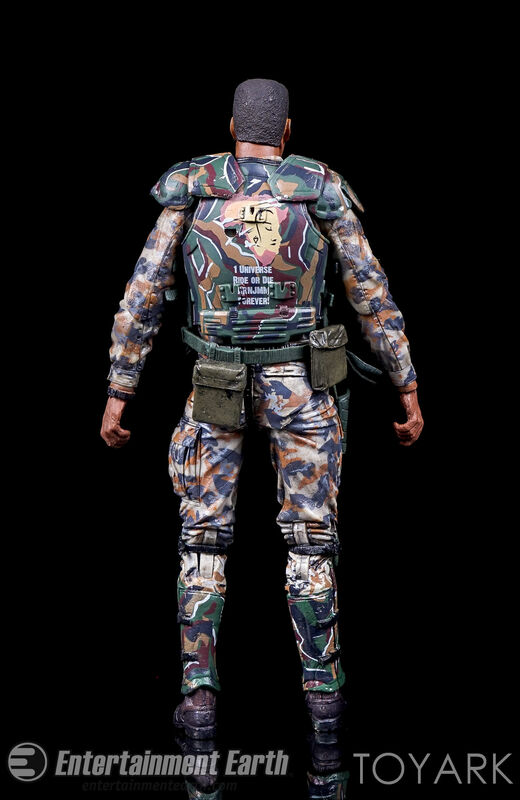 Thanks for all the kind words. 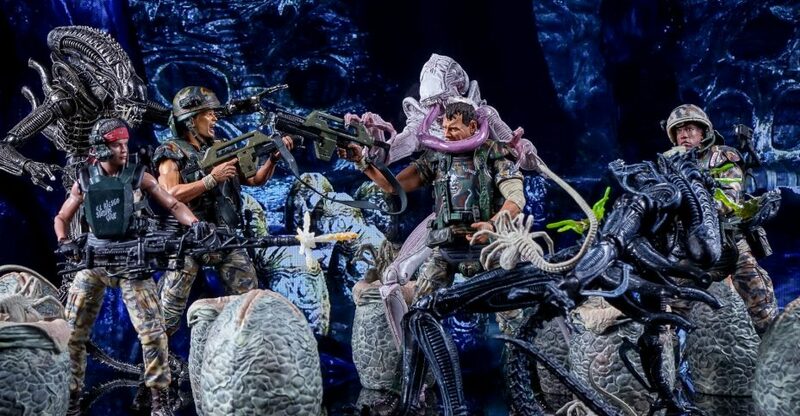 This was a fun shoot. 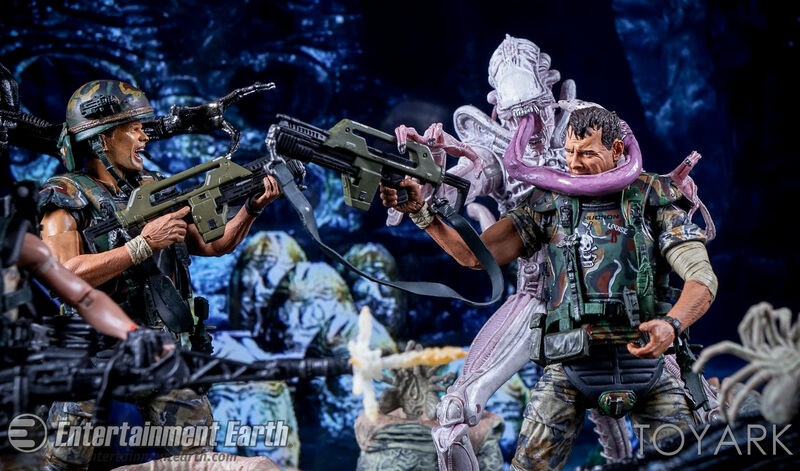 Getting more than two Marines together at a time makes the battle scenes more interesting.